This is Page 2 of 4 - the best of August 2011! This page begins at 12:24 PM on August 7th - riding the train towards our next destination. It takes you through the rest of the 7th and then part of the 8th. This page ends at 5:53 PM on the 8th of August on the Summit of Mt. 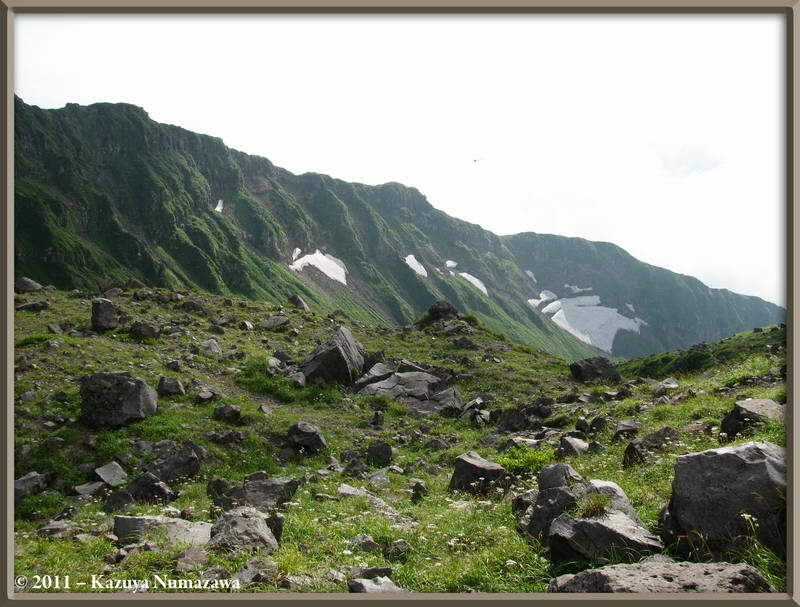 Chokai (2,236 m = 7,336 ft). Click on any thumbnail to begin. 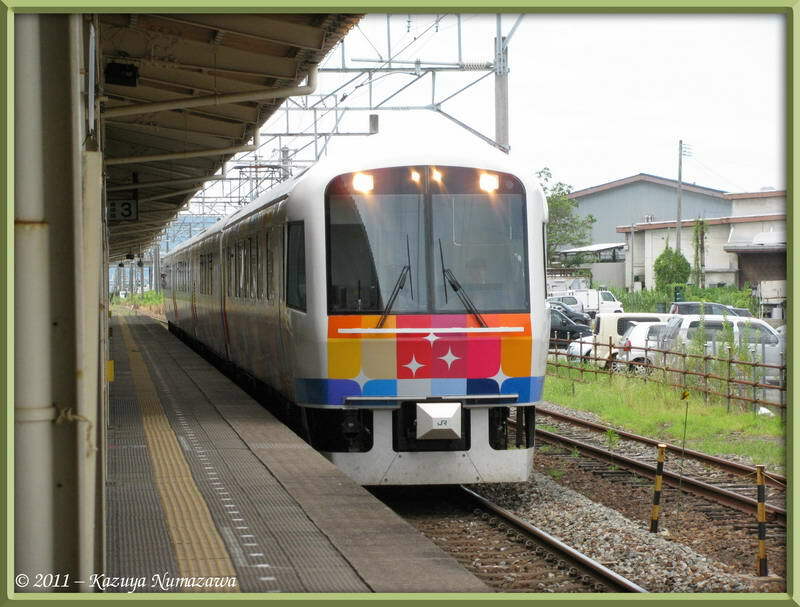 We took a bus from Hagurosan Shrine to Tsuruoka Station, ate our lunch there and were fortunate to be able to catch a Special Express Train which took us directly to our destination without having to transfer to another train. The first shot here is the train we rode. There is only one train like this per day. 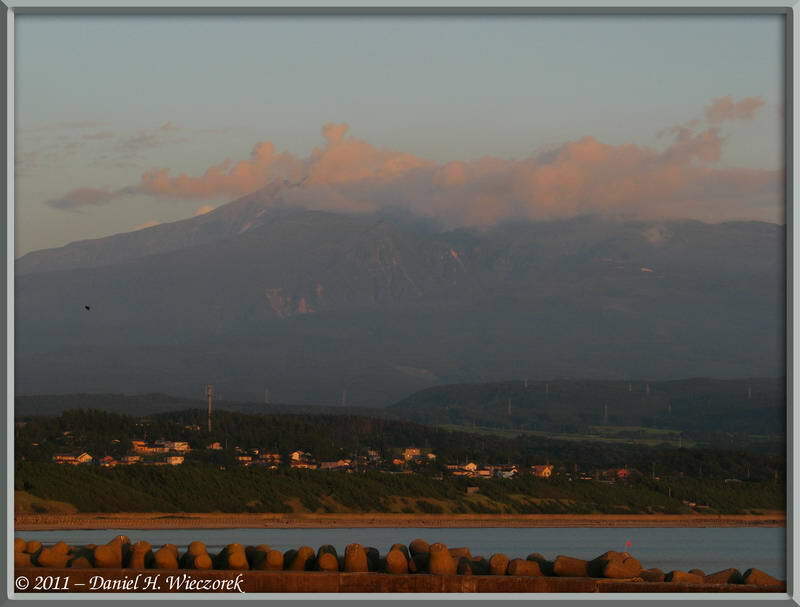 The 2nd shot shows Mt. 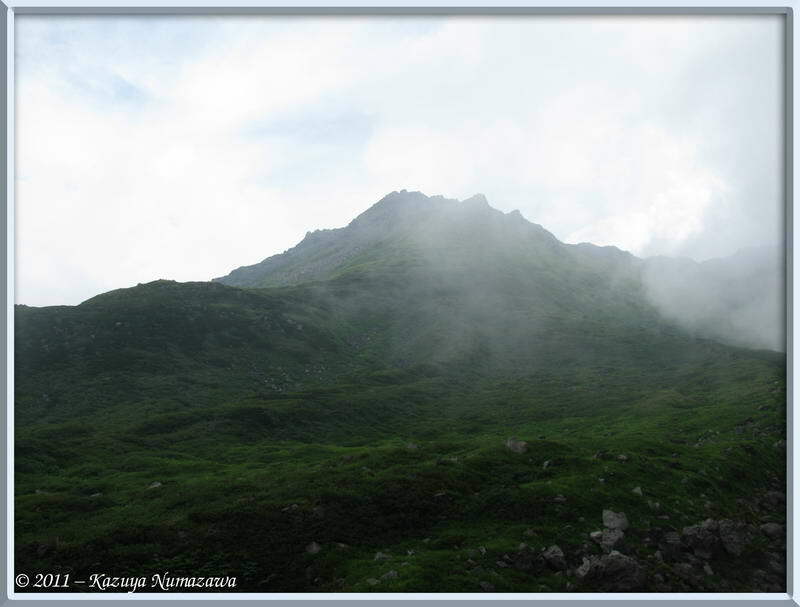 Chokai under a cloud - hopefully it will be clear when we climb it tomorrow. 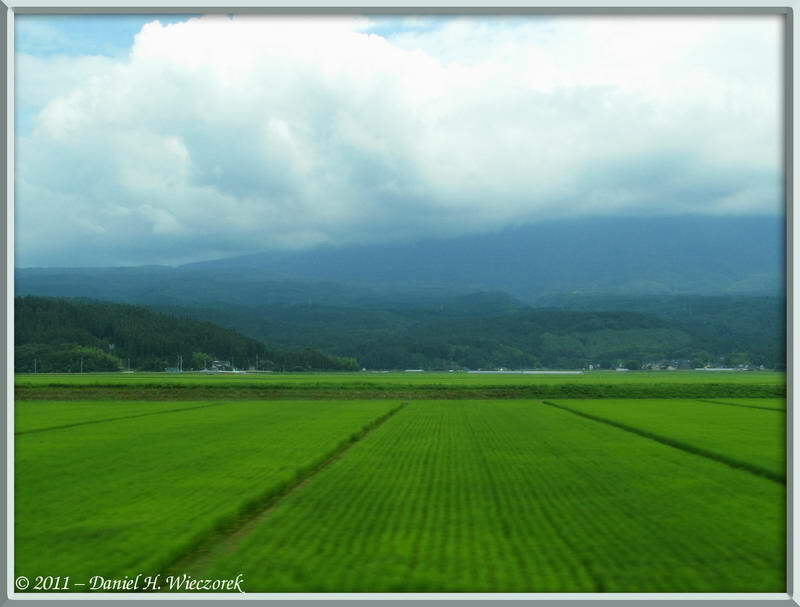 We saw this view from the train. 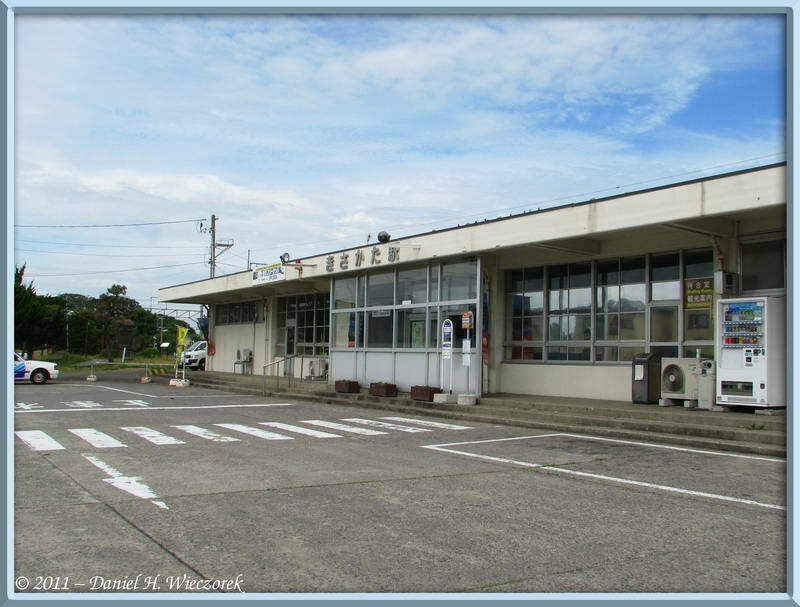 The 3rd shot is Kisakata Station - our destination for today. 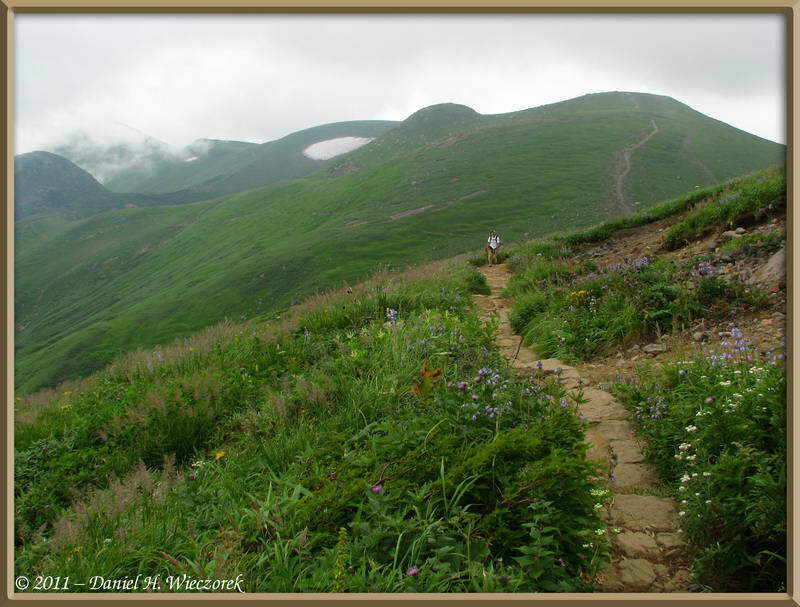 This is in Akita Prefecture. 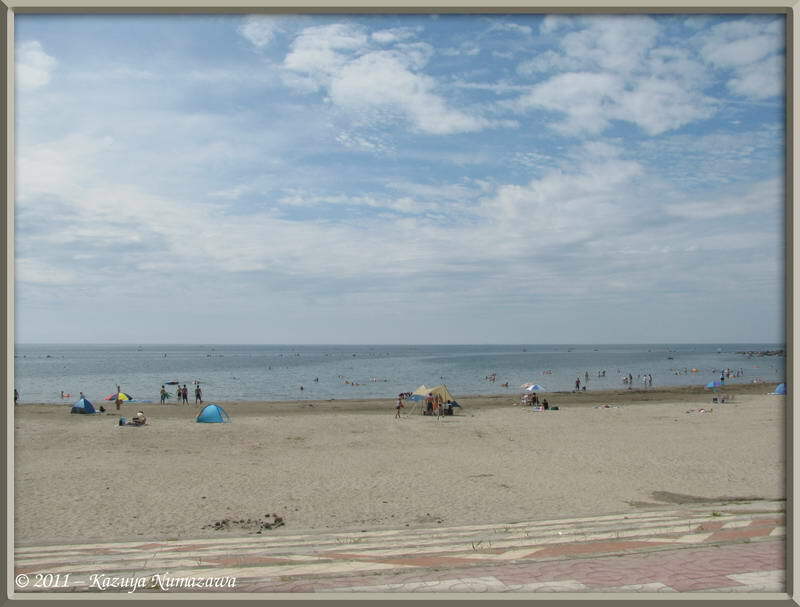 We had reservations in a hotel close to the beach at Kisakata. This is the beach which we were close to. There weren't many people because it wasn't a very large town. The 2nd shot is Mt. 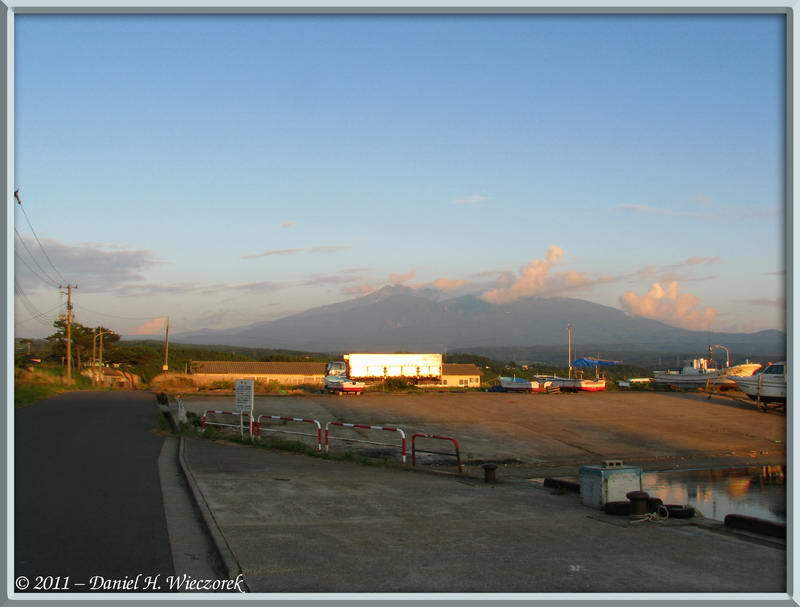 Chokai - the mountain which we'll climb tomorrow - as sunset time approached. 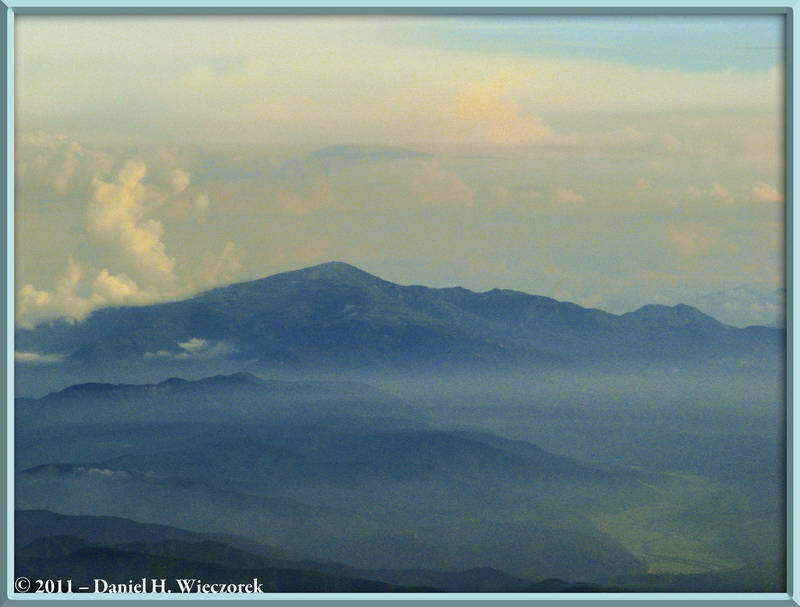 The 3rd shot is zoomed in to the summit of Mt. 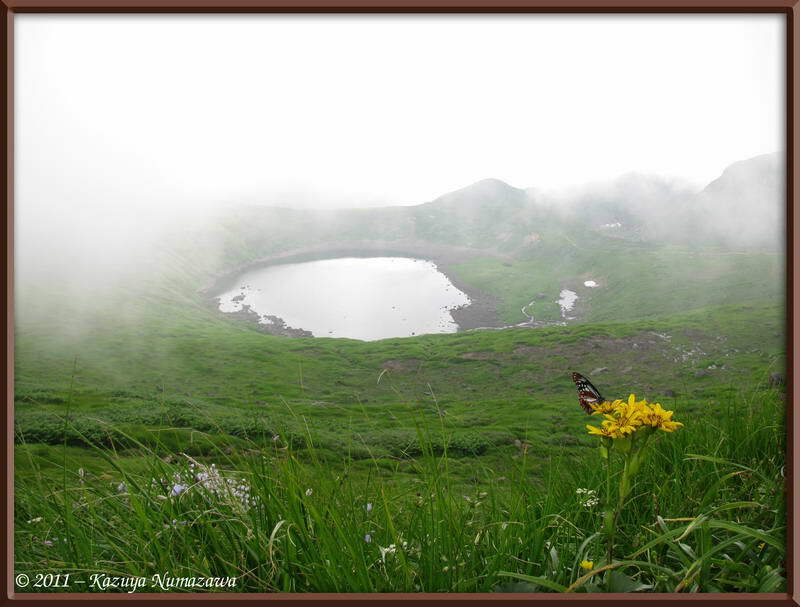 Chokai (2,236 m = 7,336 ft). We hope the weather will be this great tomorrow when we are up there! 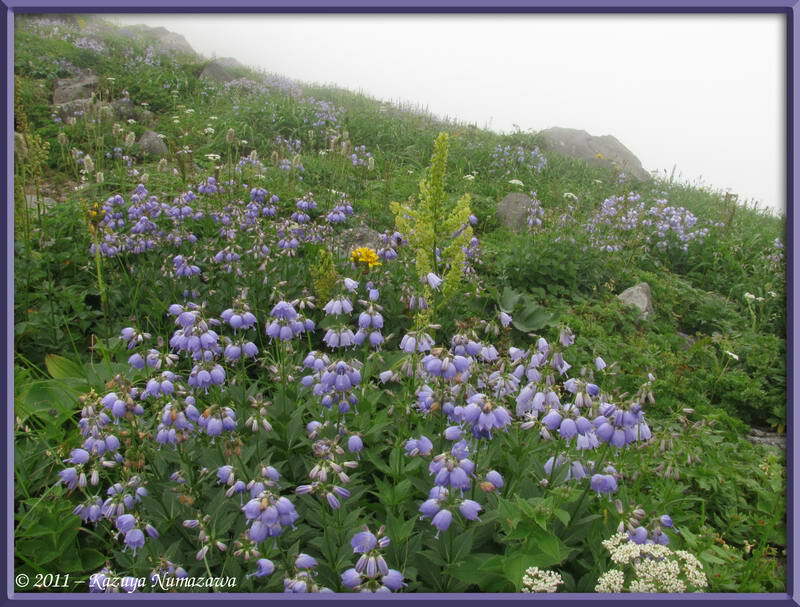 Here is another shot of the summit area of Mt. Chokai - we hope that it will NOT be like this tomorrow. 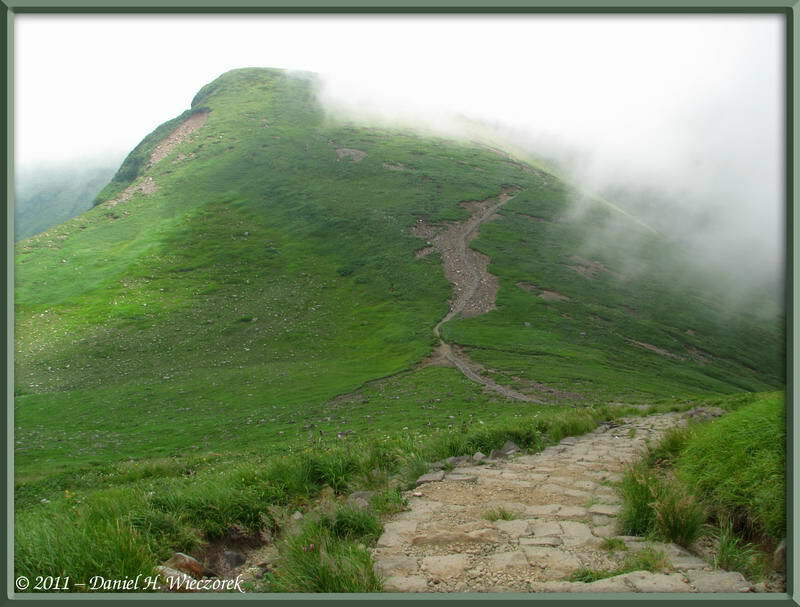 This will be the 3rd time we have climbed this peak. 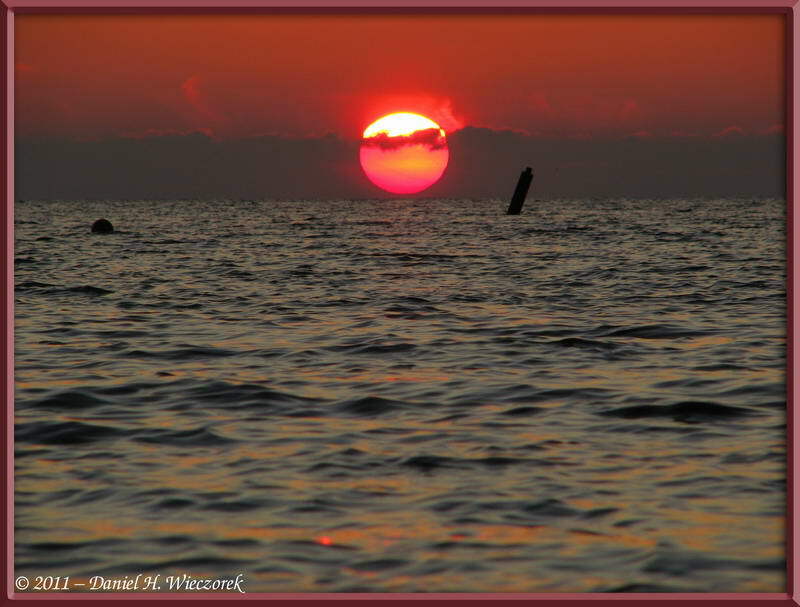 The first time we had a fairly decent sunrise, the 2nd time we had a good sunset. What will we have this time? 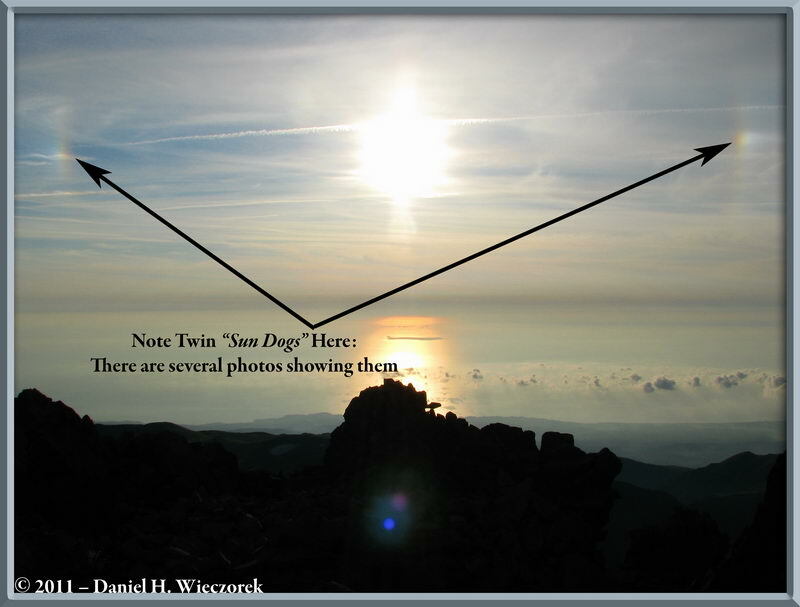 The 2nd and 3rd shots show the sun sinking into the Sea of Japan. 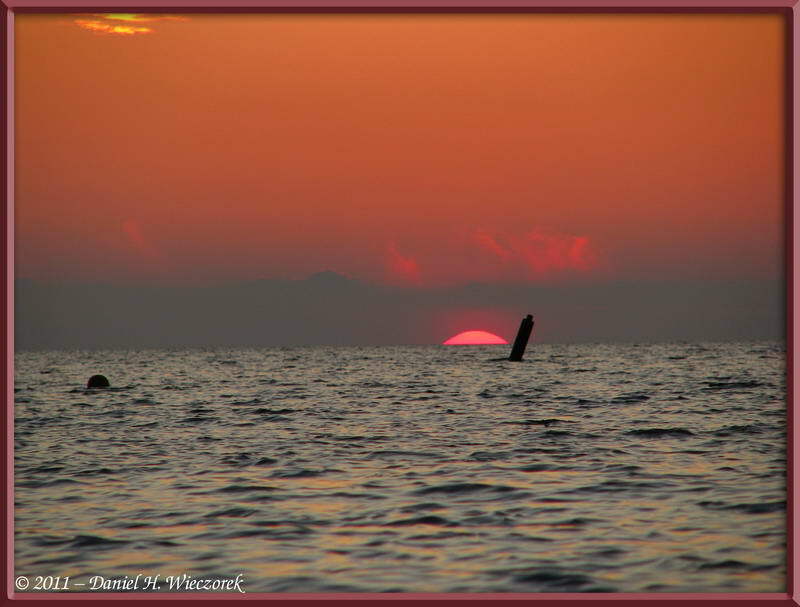 Here are 2 final shots of the sun sinking into the Sea of Japan. On the way back to our hotel from the beach we stopped at a nice restaurant and ate supper. 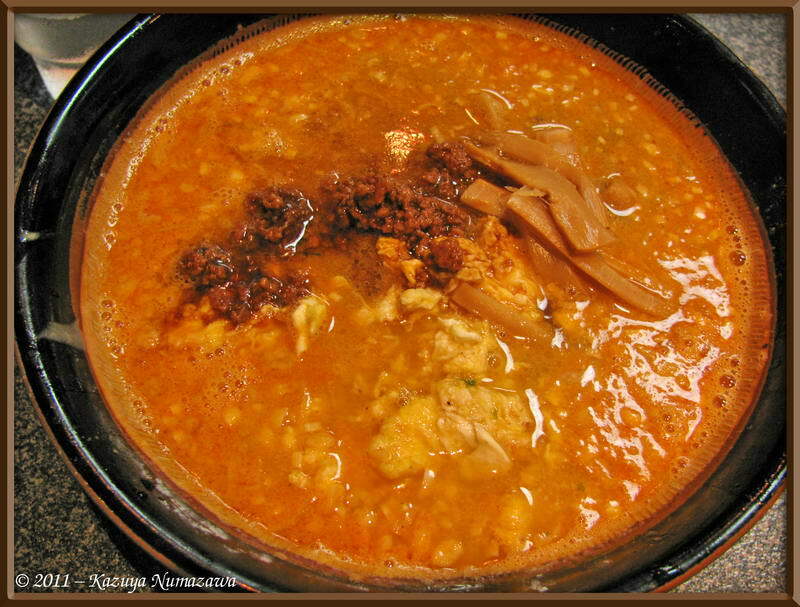 The restaurant's specialty was tantanmen (men = noodles - so tantan-noodles). This is a shot of our supper. It was very delicious. We got up at the hotel at 4:45 AM on August 8th, got ready and packed our bags and checked out. The owner gave us a ride to the Train Station - which was where we were to take a bus from. We took a 6:10 AM mini-bus bound for the starting point for the climb of Mt. Chokai. In years past we had stayed in Sakata and from there the bus starts much later. This would give us the earliest start we have ever had for our climb. We arrived at Hokodate - the starting point - at 7:20 AM. We noticed that there were several signs around warning of bear danger. 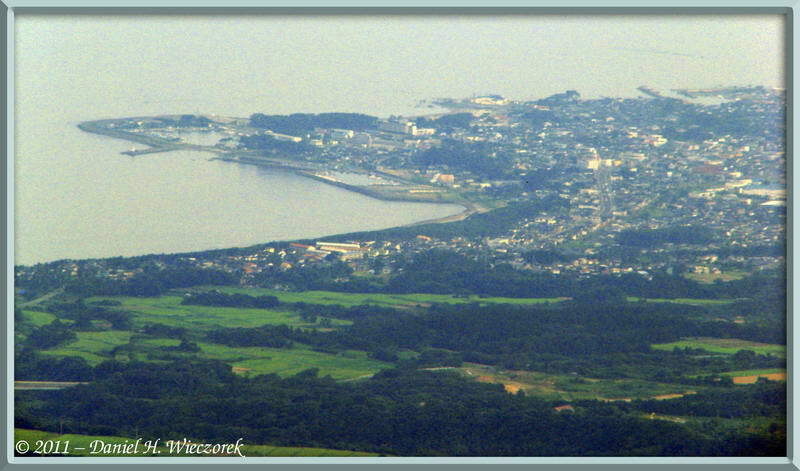 The first shot is looking back towards Kisakata Beach from the starting point of our climb. We stayed down there near the boat harbor. 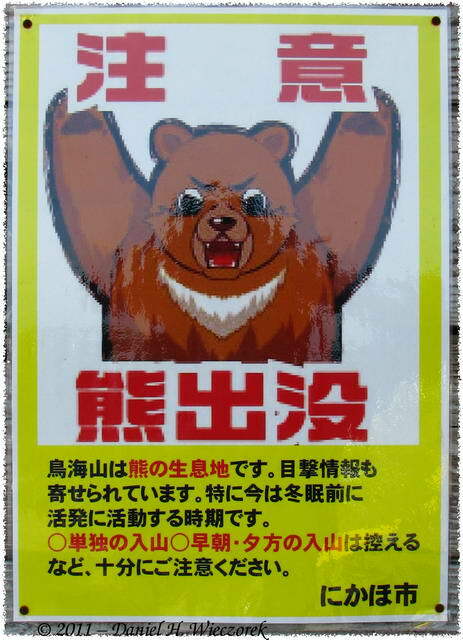 The 2nd shot is one of the bear warning signs. The 3rd shot is looking up the canyon to the summit of Mt. Chokai. This is the first time we've ever been able to see the summit from here. It may be a great weather day! This image is actually composed of 3 exposure-bracketed shots which have been Tone-mapped with Photomatix-Pro using the Details-Enhancer Option. Okay, now we are climbing the mountain. 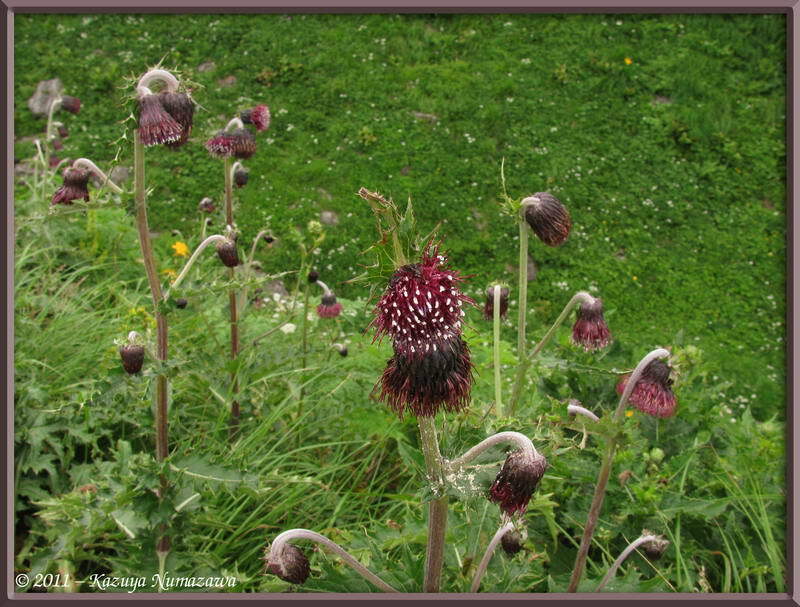 The first shot is a Chokai Thistle - Cirsium chokaiense. 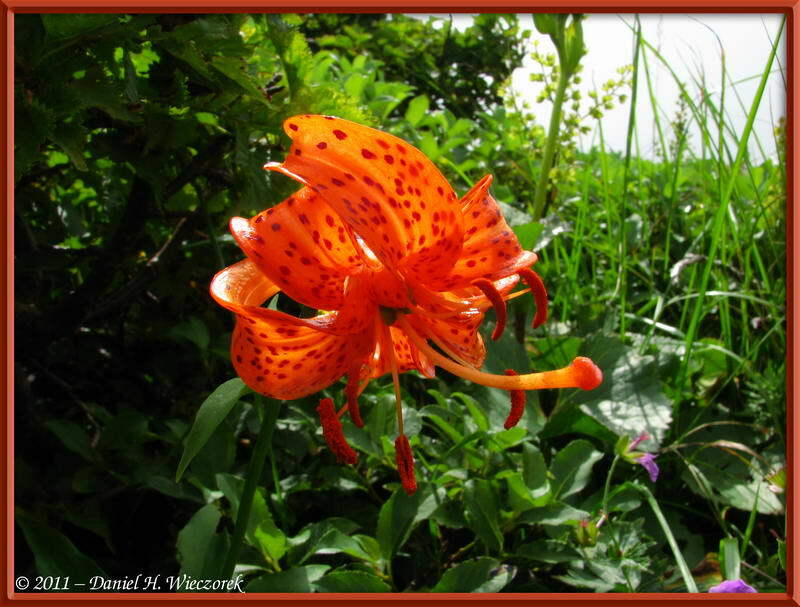 The 2nd shot shows Lilium medeoloides - obviously a lily. 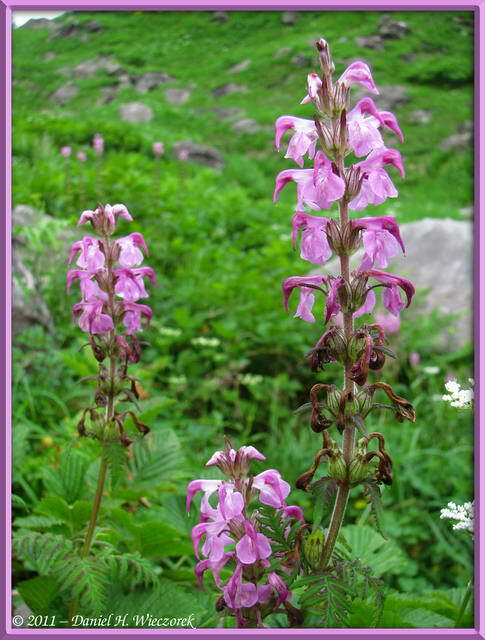 The 3rd shot is Pedicularis chamissonis var. 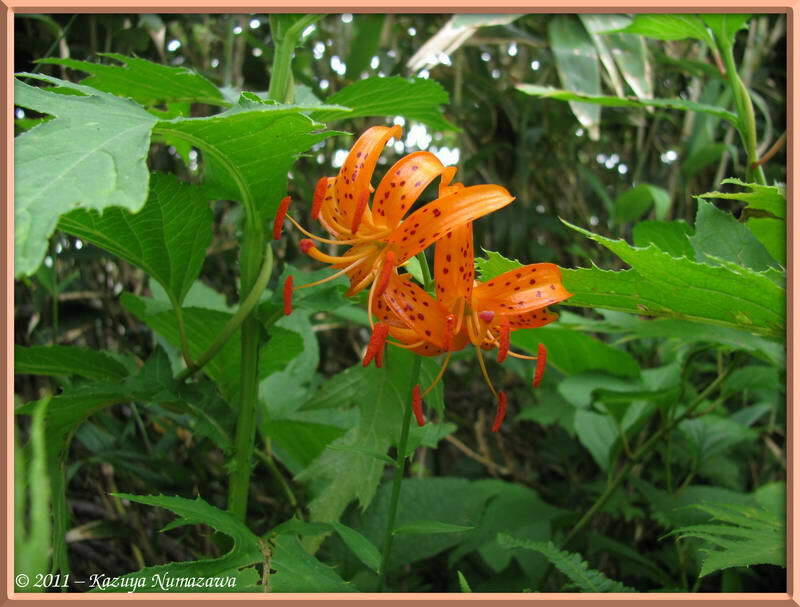 japonica. You saw shots of this from our climb of Mt. Gassan, on the previous page. 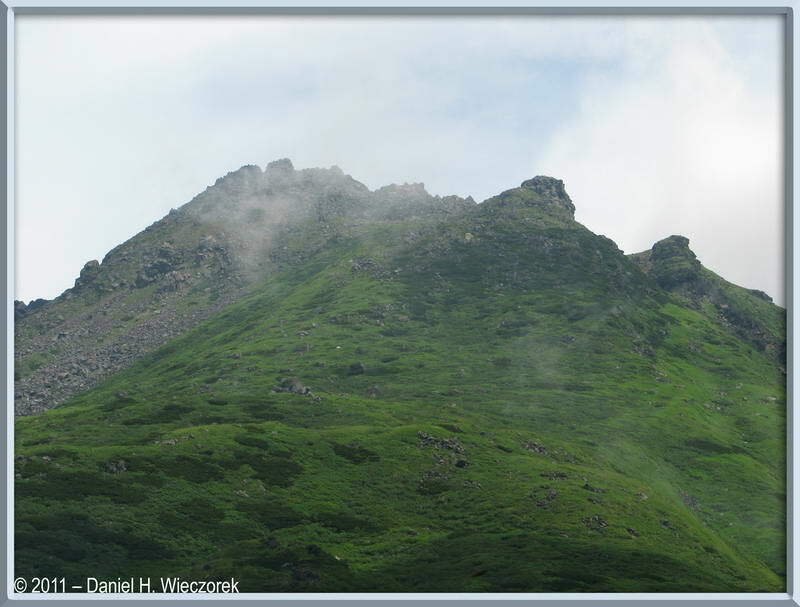 By the way, you may not remember it, but we climbed this mountain in August 2005 and again in August 2008 - seems like we climb it every 3 years - this is our 3rd climb of this peak. To see photos of the previous climbs click HERE for 2005 Photos and go down to Row 14. For the 2008 photos click HERE and scroll down to Row 8. 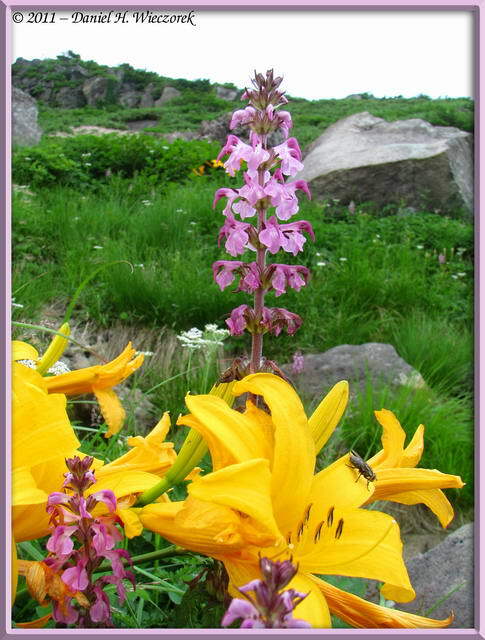 Here is me shooting some lilies on the side of the mountain. Our necks got pretty sunburned on our Mt. Gassan Climb - so I am protecting it here. 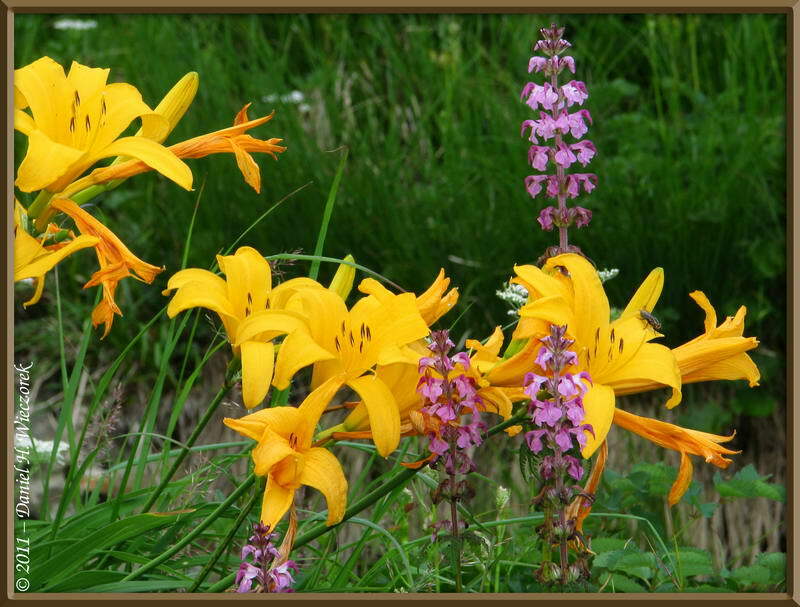 The 2nd and 3rd shots are both stunning shots which show Hemerocallis dumortieri var. 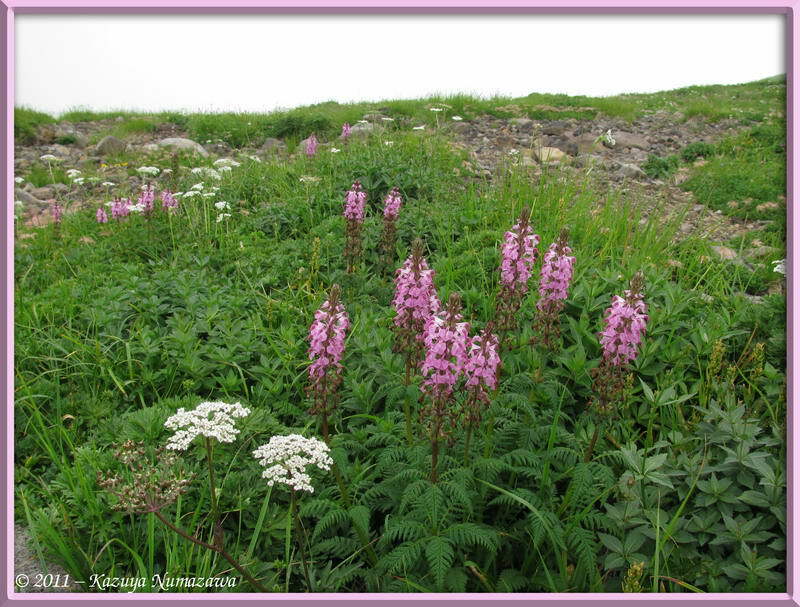 esculenta (The Lily) and Pedicularis chamissonis var. japonica (The Pink Flower). 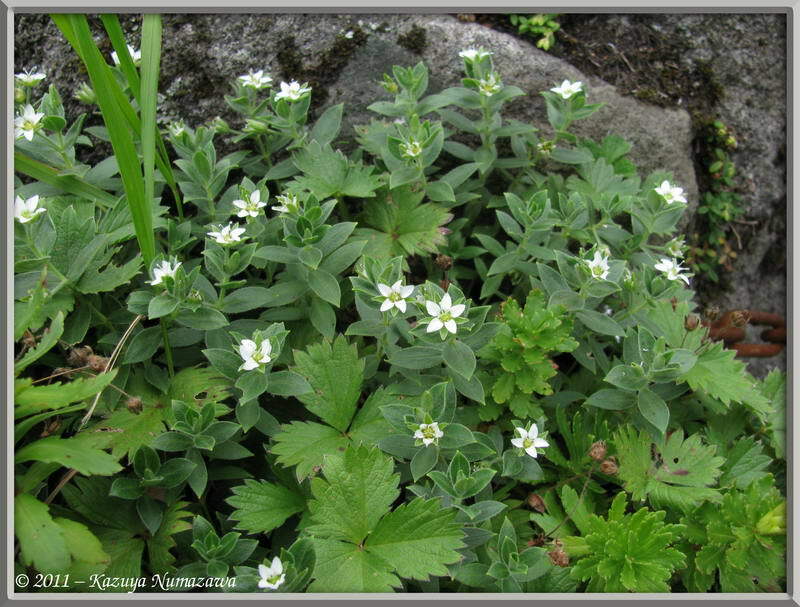 The first shot here is a patch of Geum pentapetalum. 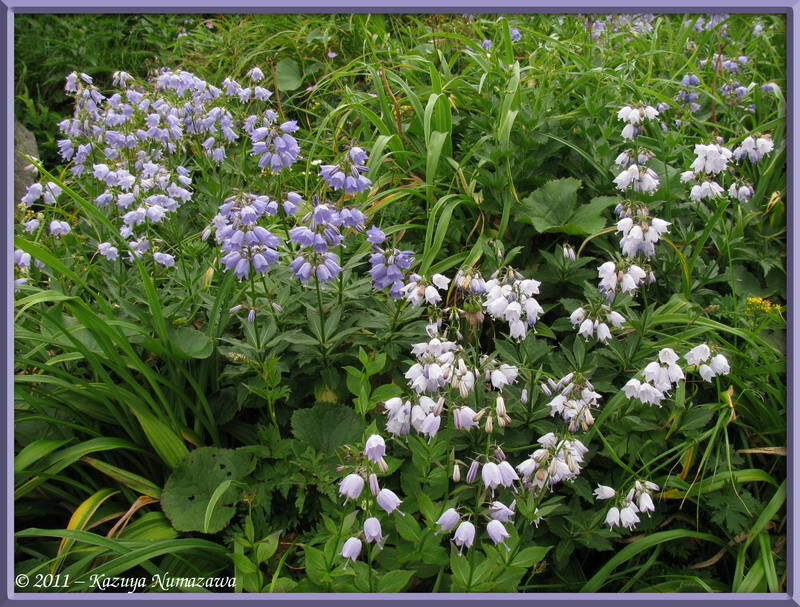 The 2nd and 3rd shots both show Blue and White Adenophora triphylla var. hakusanensis. In first position in this row is a Parantica sita butterfly on a Ligularia hodgsonii flower. 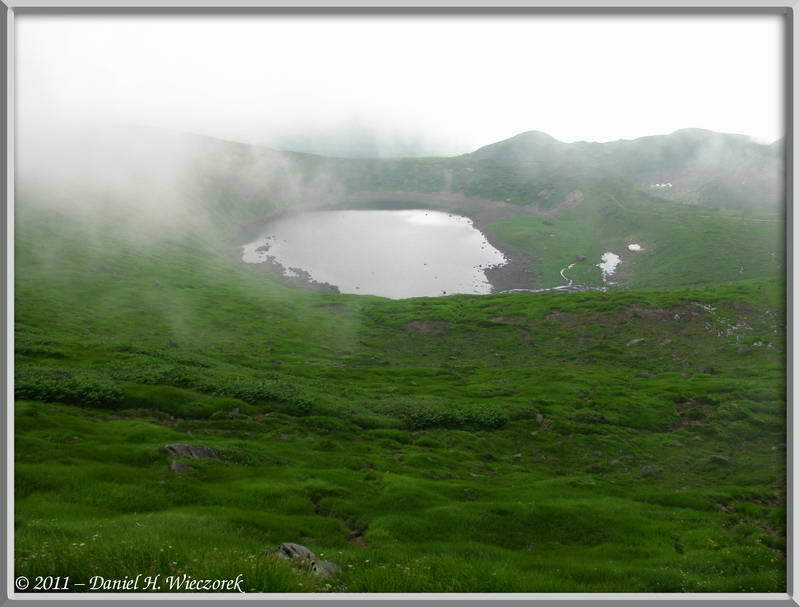 In 2nd position is Lake Chokai - with MUCH less snow around it than we saw in both 2005 and in 2008. 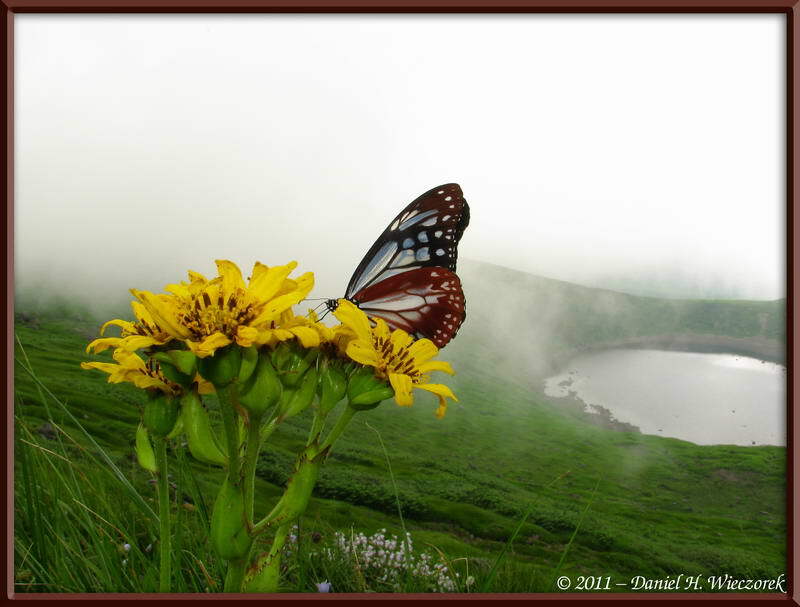 The 3rd shot shows Lake Chokai and the same butterfly and flower as shown in the first photo. 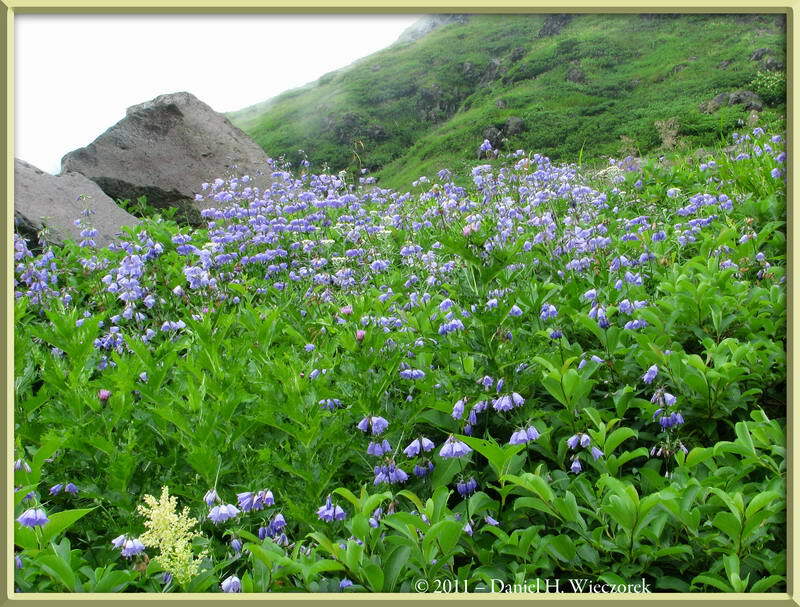 Here is a shot of Kazuya interrupted from his flower photography while we were on a break at the hill overlooking Lake Chokai. There is a Mountain Hut here which we cannot imagine why people stay at - it is only a couple of hours from the starting point. Maybe it is several hours from some other starting point than the one we use?! The 2nd and 3rd shots show Adenophora triphylla var. 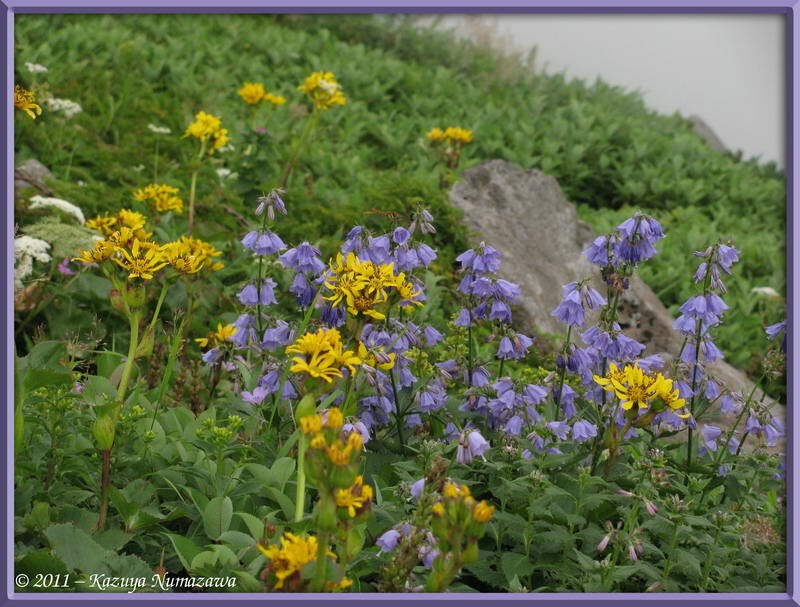 hakusanensis, Ligularia hodgsonii and several more flowers. 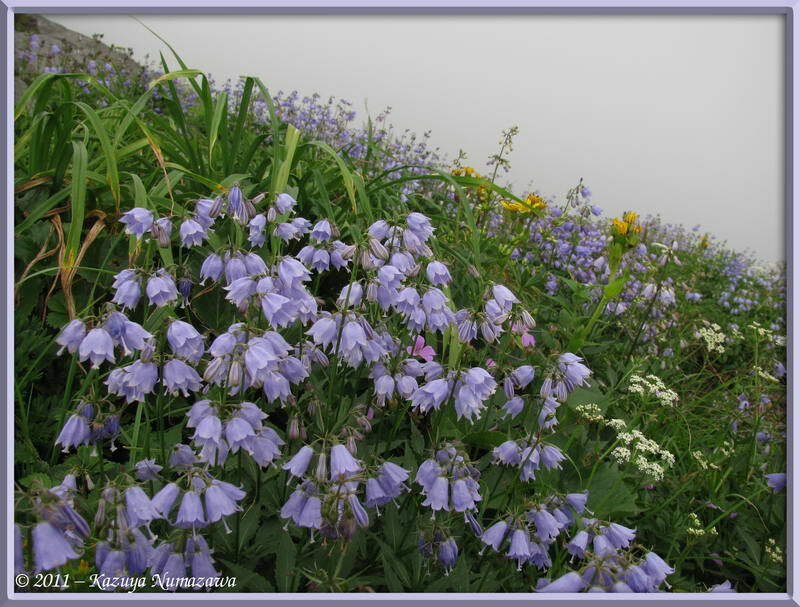 Here are 3 shots showing Adenophora triphylla var. 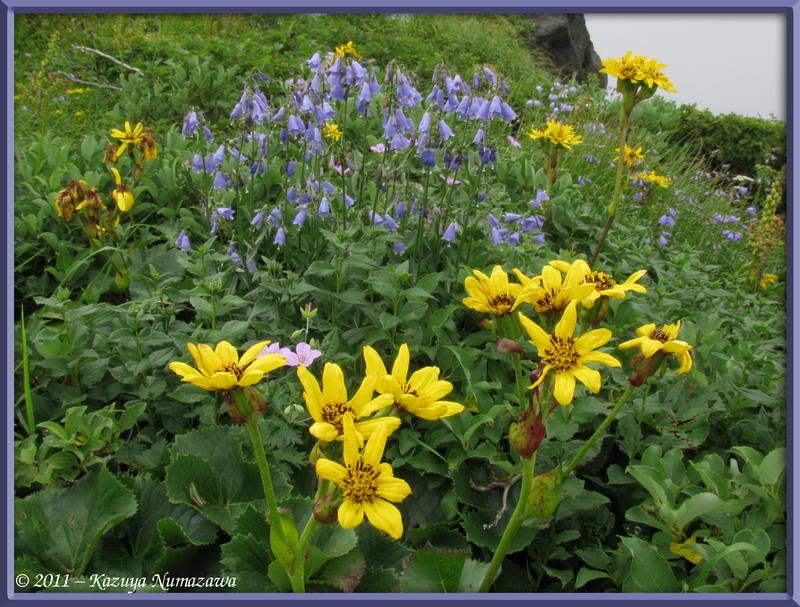 hakusanensis (the small bell-shaped flower), Ligularia hodgsonii (the yellow flower) and more flowers. The first 2 shots show Adenophora triphylla var. 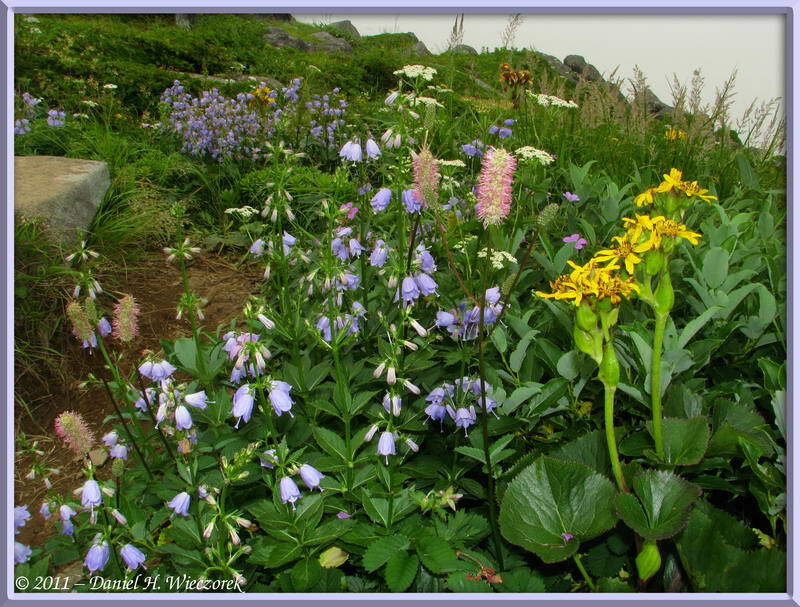 hakusanensis (the small bell-shaped flower), Ligularia hodgsonii (the yellow flower) and more flowers, while the 3rd shot shows you a beautiful Lilium medeoloides. 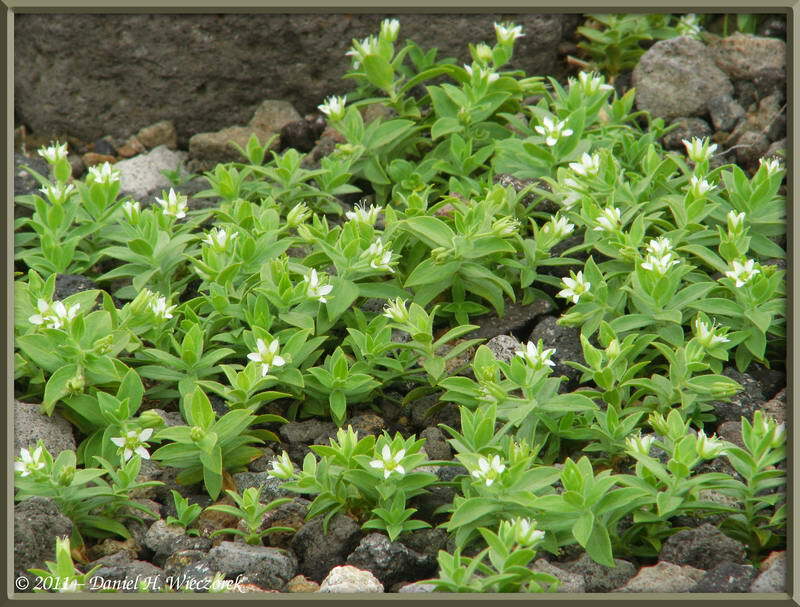 The next 5 shots show you a rare flower - Arenaria merckioides var. chokaiensis. 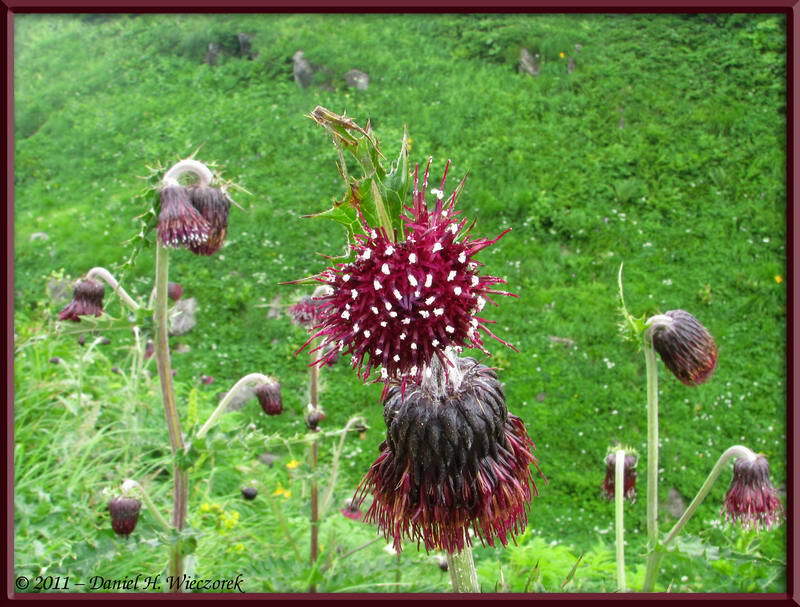 In both 2005 and 2008 when we climbed this mountain we found just a VERY FEW of this flower and they were covered with so many rain drops that we never did get any decent photos of it. 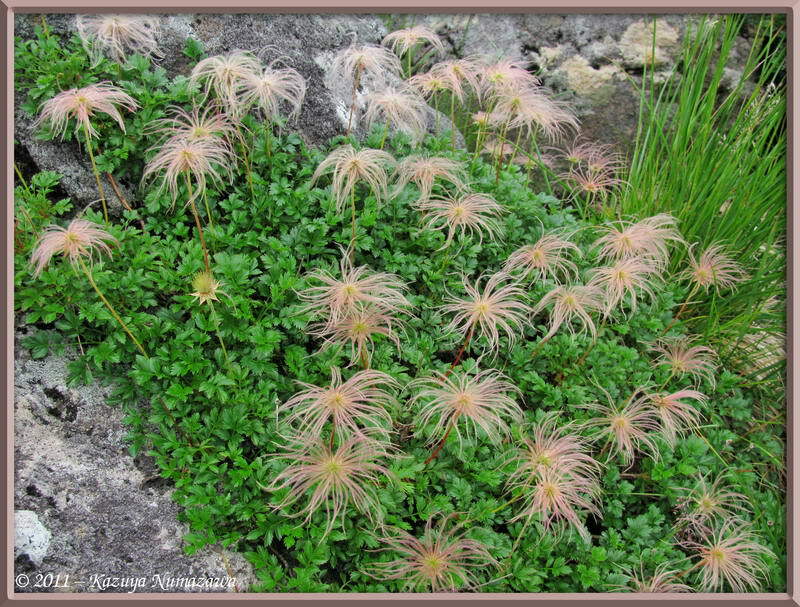 This time we saw a great abundance of this rare species and even got some great photos. You'll see more of this as we continue our climb. 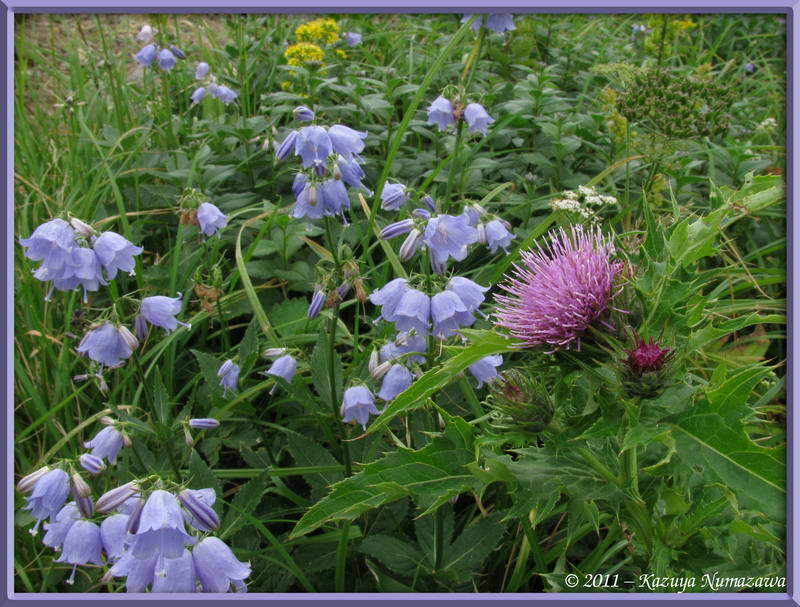 Note that these 5 photos (3 here and 2 in the next row) are increasingly closer to the flower. 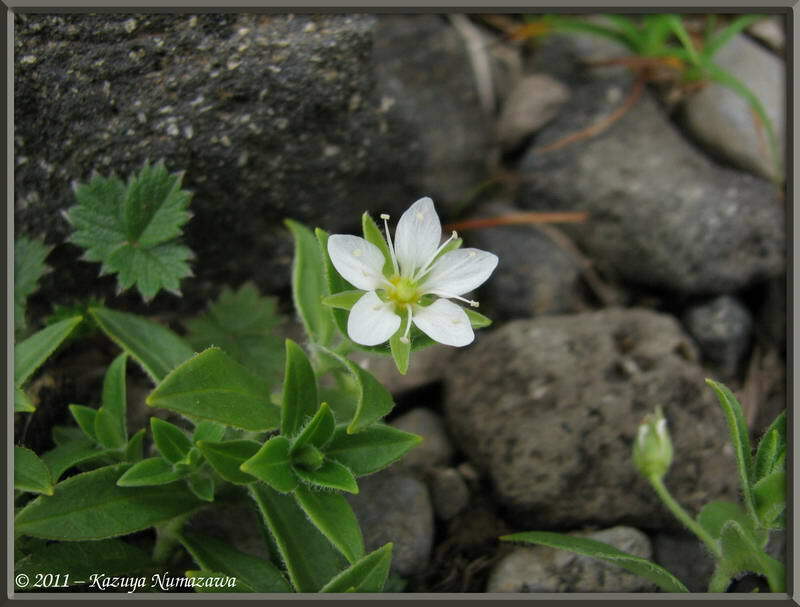 Here are the 2 closest shots of this rare flower - Arenaria merckioides var. chokaiensis. 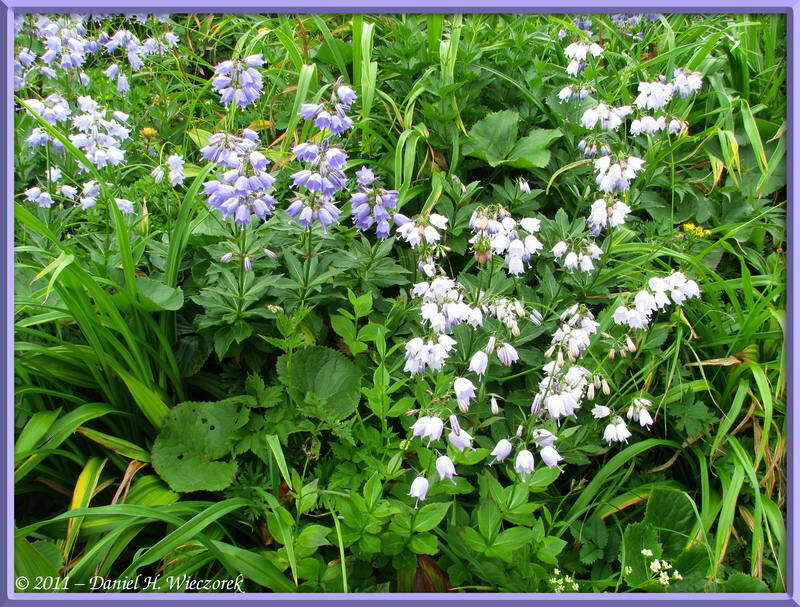 It is found only in this vicinity, which is why it is named "var. chokaiensis. 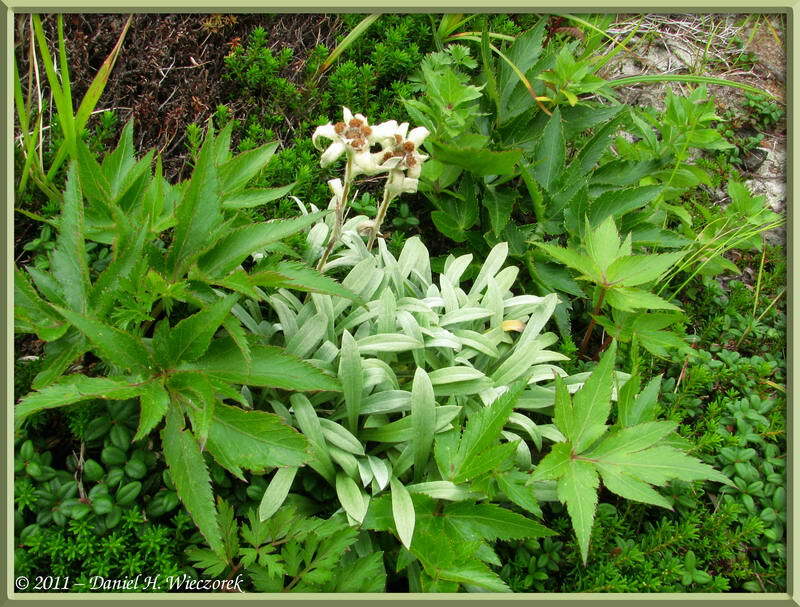 The 3rd shot is an Edelweiss - Leontopodium fauriei. 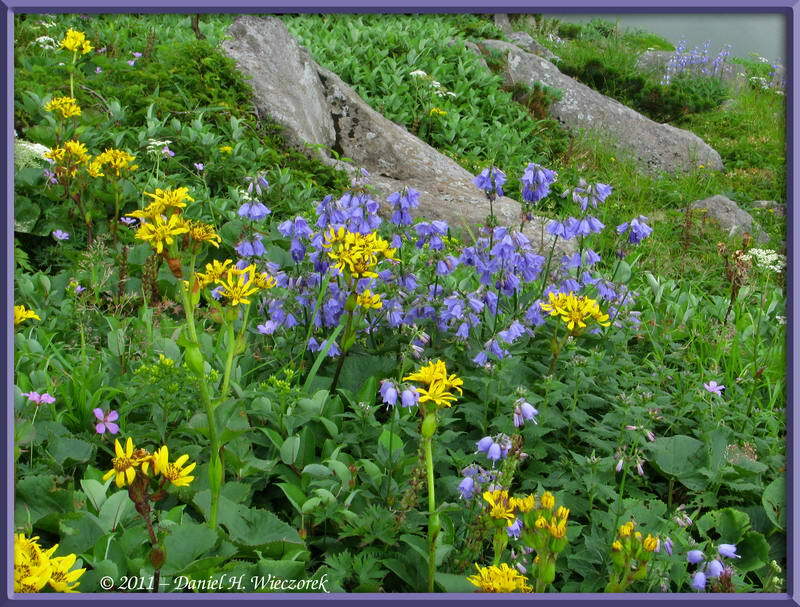 We had never found Edelweiss on this mountain before this year, possibly because the weather was not as nice in years past and we weren't seeing as good? 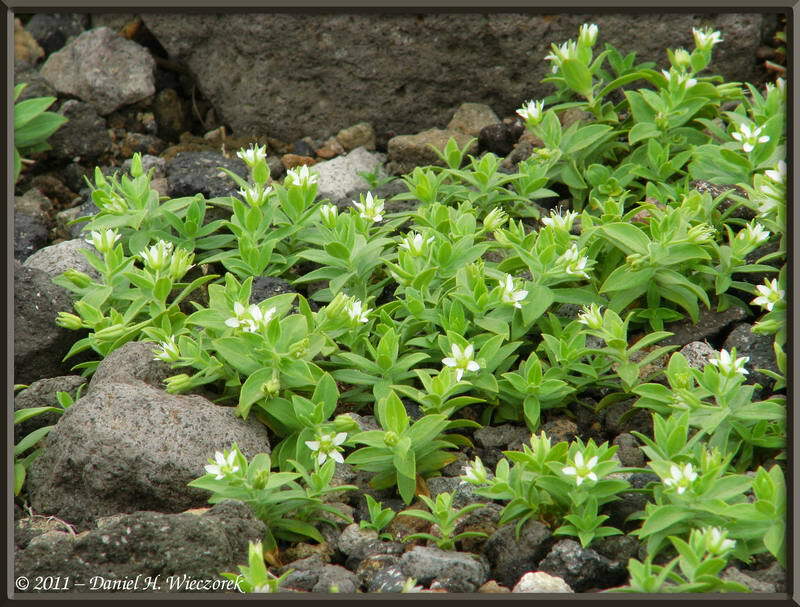 You may note that this is the same genus and species of Edelweiss as we found on Mt. Gassan. We're going that way, which means we now have to descend into a pass and then climb up the other side. 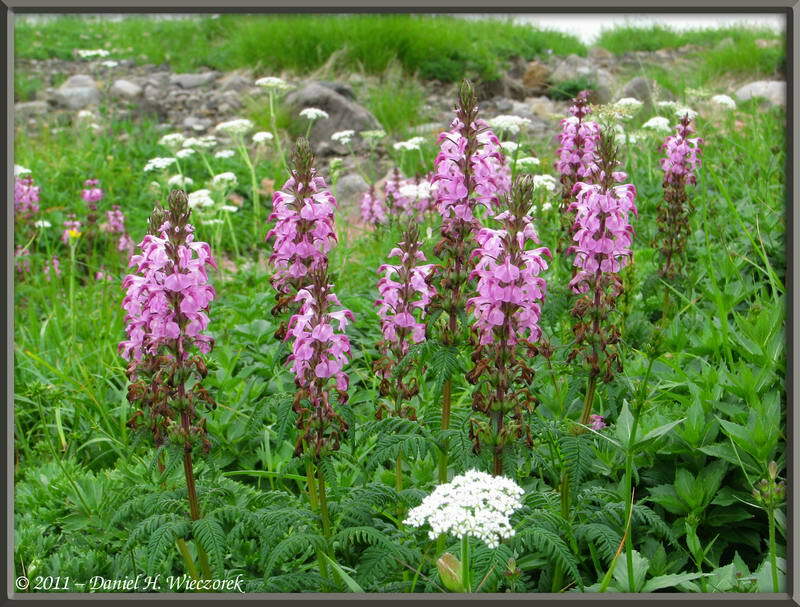 The 2nd and 3rd shots show Pedicularis chamissonis var. japonica and more flowers. 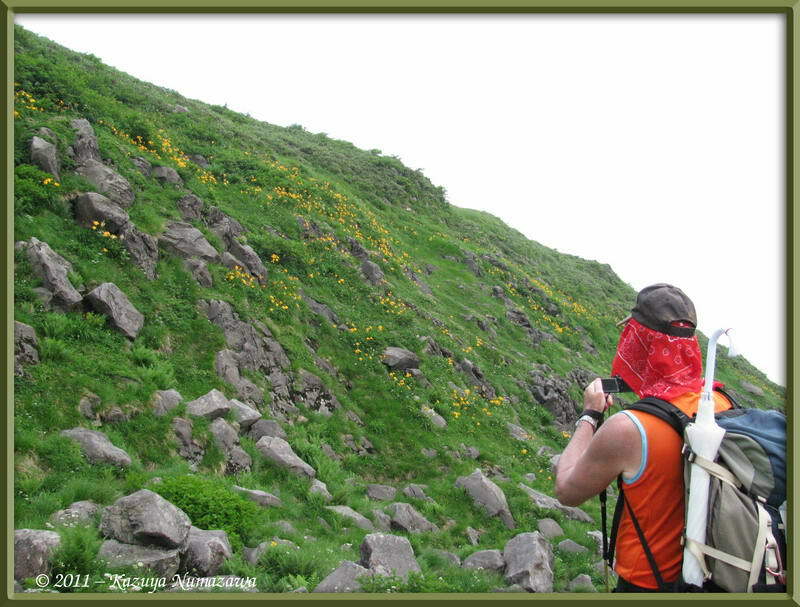 Here comes Kazuya - he is often behind me taking photos as we climb. 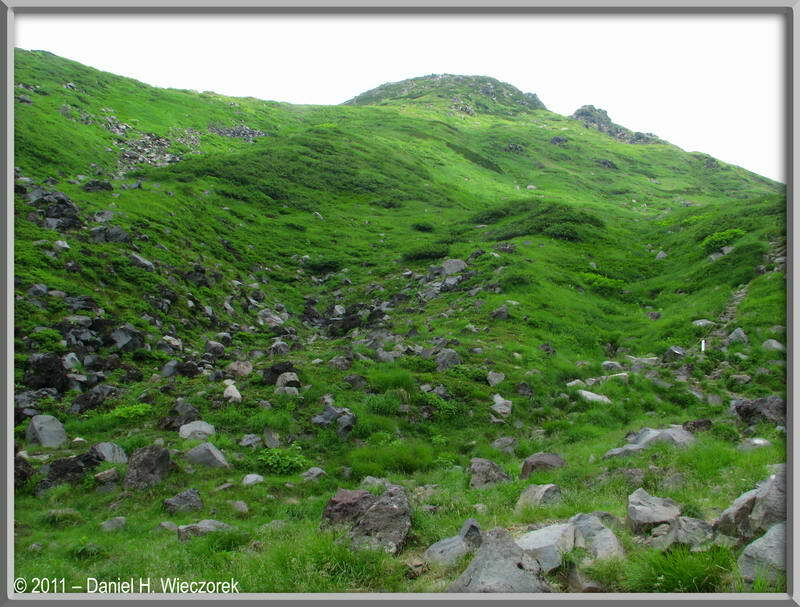 This is looking back from the way we came - after we went through the pass shown in the photo in 1st position in Row 15. The 2nd shot is me - from Kazuya's viewpoint. Notice all of the flowers! 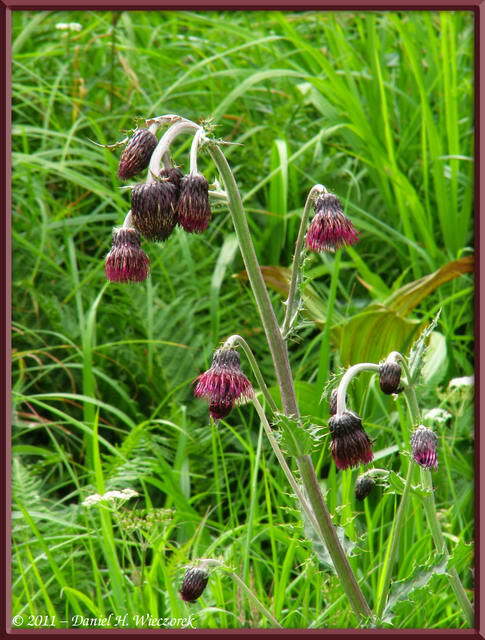 In 3rd position is a Chokai Thistle - a Cirsium chokaiense. This species is found only around here. The first photo shows mostly Adenophora triphylla var. 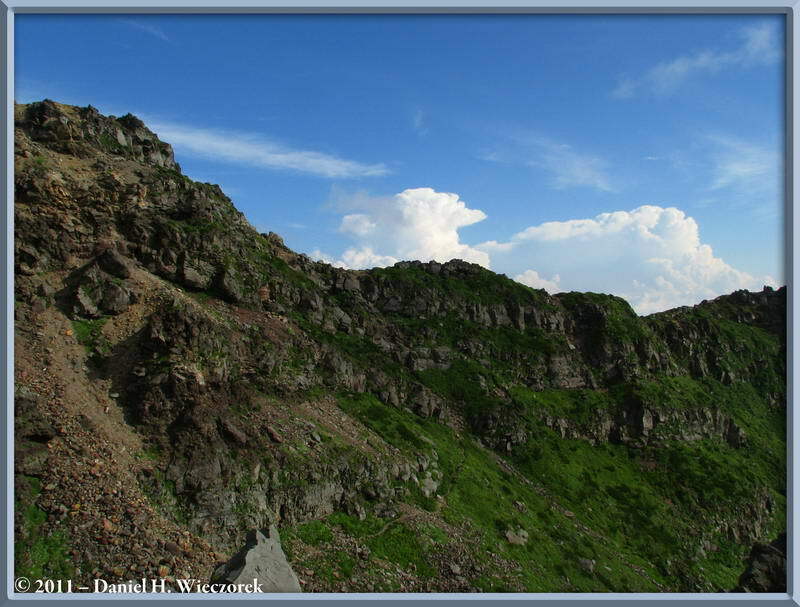 hakusanensis, the 2nd photo shows mostly Chokai Thistle (Cirsium chokaiense) and the 3rd shot shows another patch of Arenaria merckioides var. 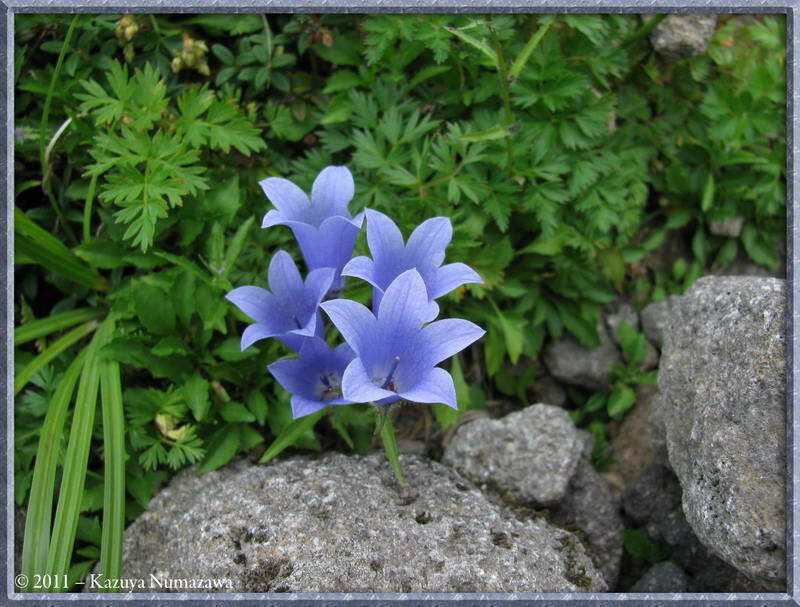 chokaiensis - that rare flower. We are getting closer and closer to our destination. 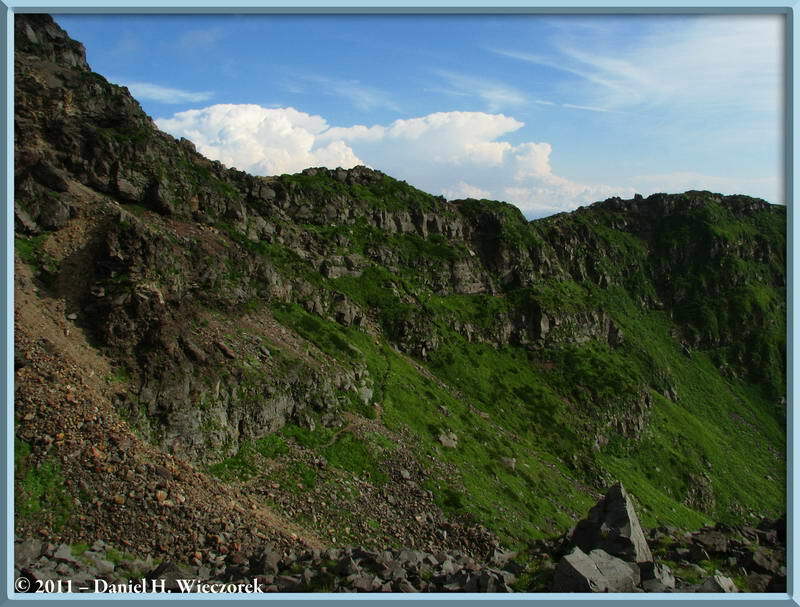 The 1st shot is looking up at the summit of Mt. 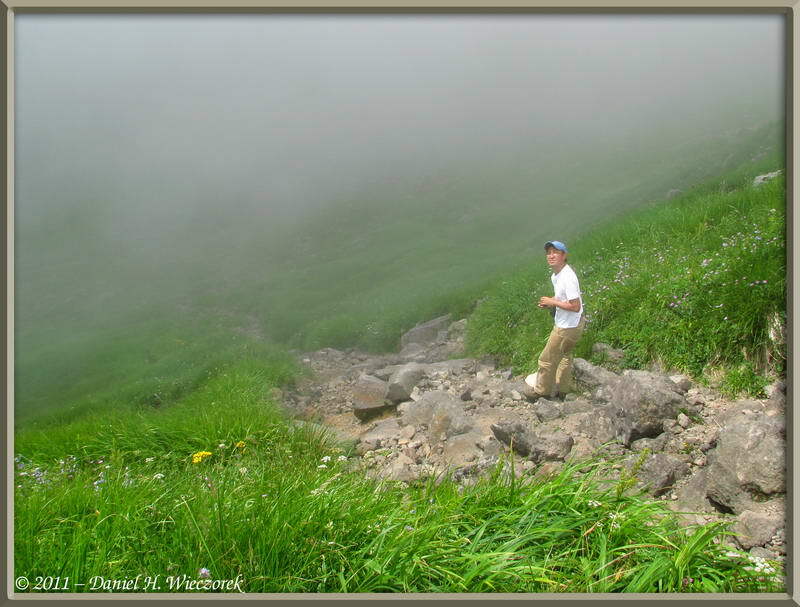 Chokai through thin clouds. 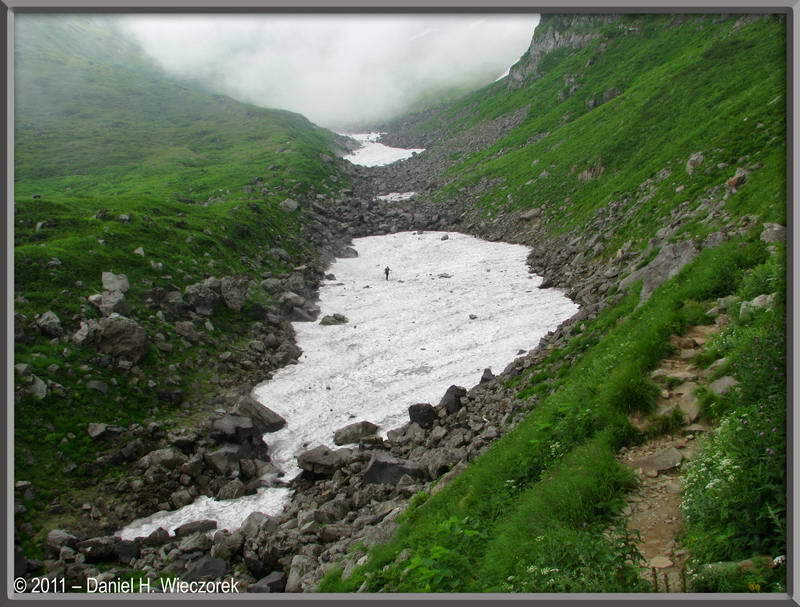 The 2nd shot shows a person crossing a snowfield which we too must cross. 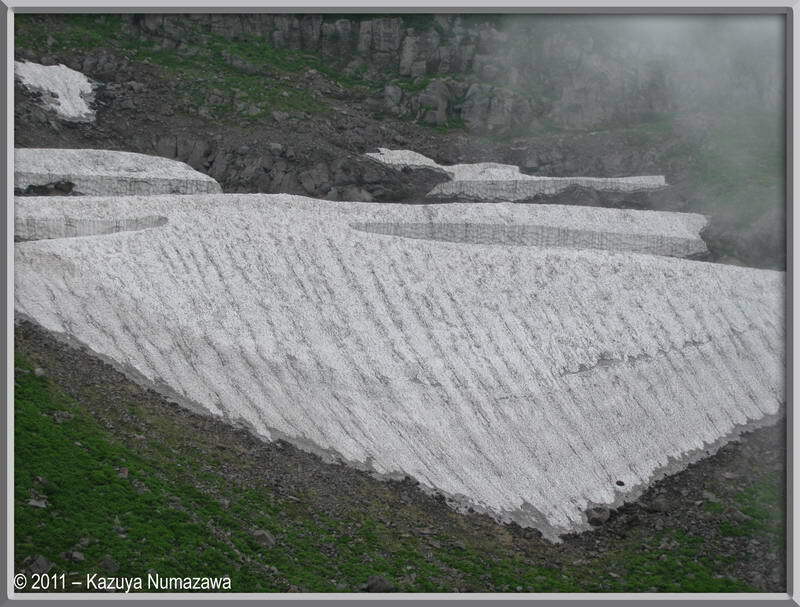 This snowfield is much smaller than it was in 2005 and 2008. 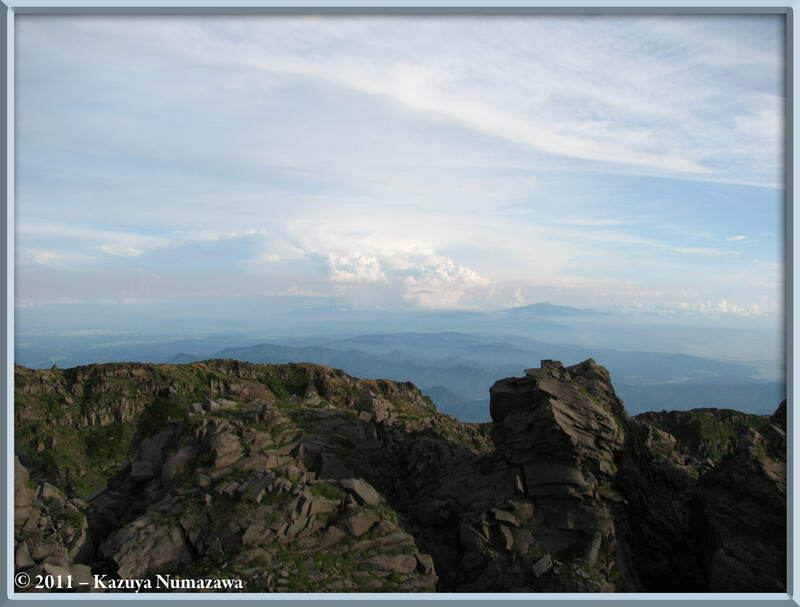 The 3rd shot is one more which looks up at the summit area. 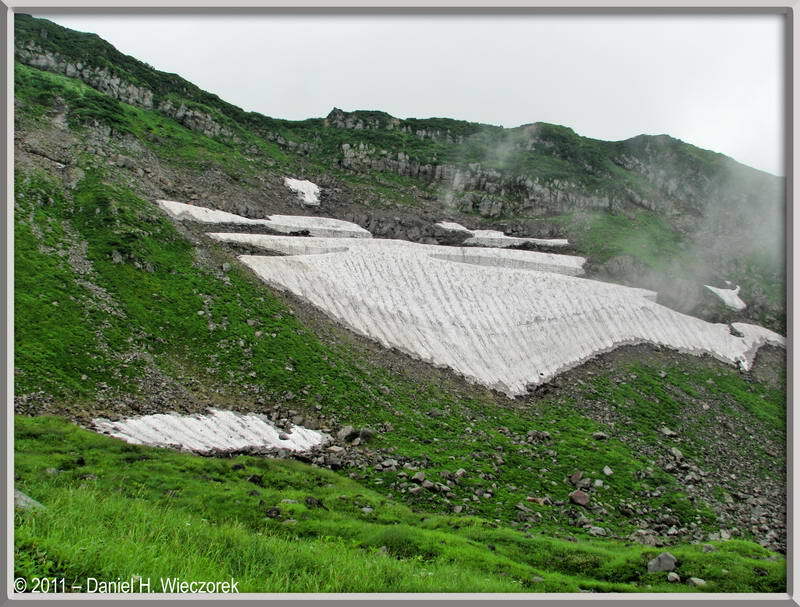 Now we have crossed that snowfield and are climbing up the slope on the opposite side. This is the final push - for about an hour - before we arrive at the summit hut. The 2nd and 3rd shots show a snowfield which we have to wonder - "why does it have those vertical walls"? 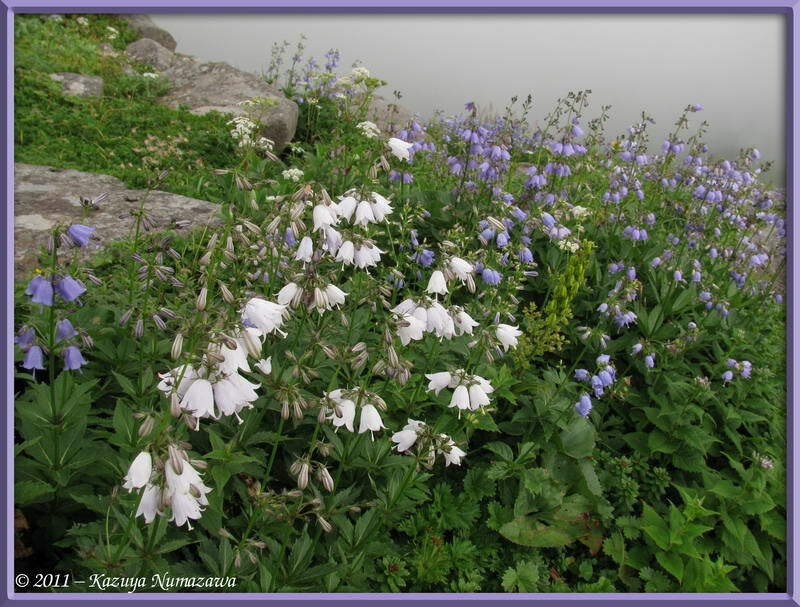 Here is a beautiful Campanula lasiocarpa. 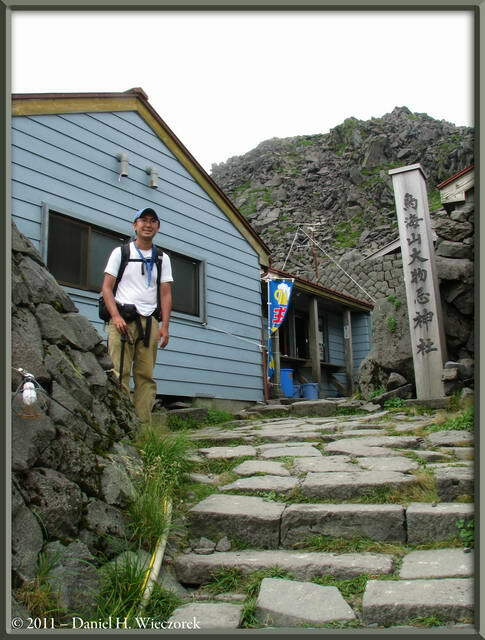 It is followed by a shot of Kazuya at the summit hut sign-in building. Of course the summit hut is not actually at the summit of the mountain. 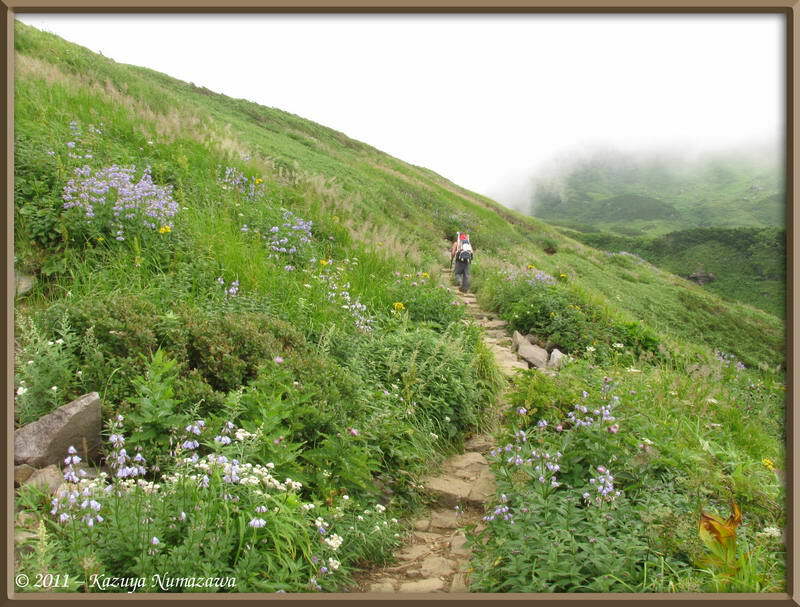 It is about 30 minutes from here to the very peak of the mountain along a VERY rocky route. After we got checked in and unpacked a little bit, we relaxed and wandered around the hut area. 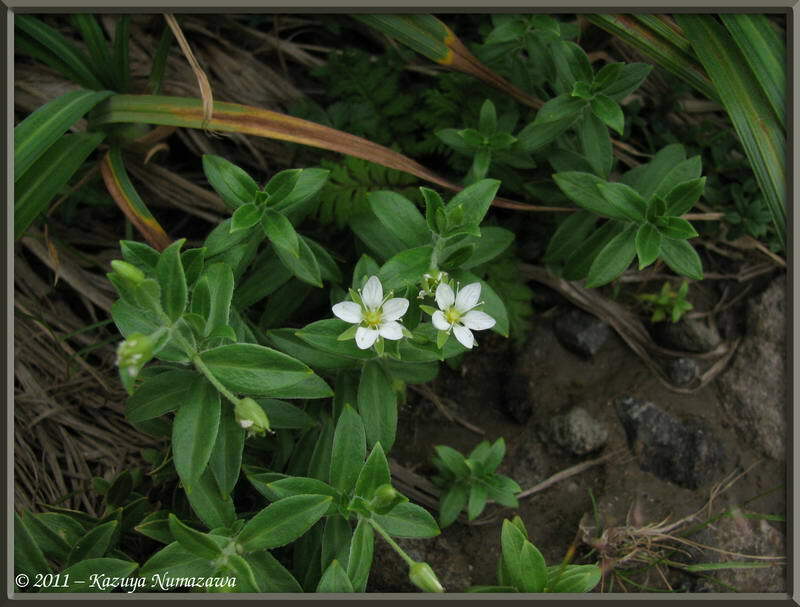 We found LOTS of flowers - this 3rd photo shows Adenophora triphylla var. hakusanensis. 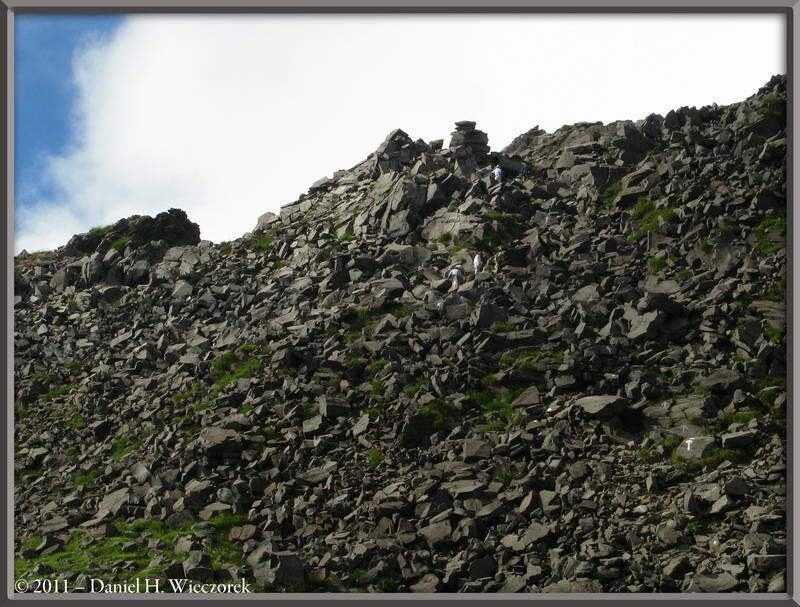 The first shot shows people climbing up towards the summit. You can see the rocky route the 3 climbers are using. The 2nd shot is a scenery shot. 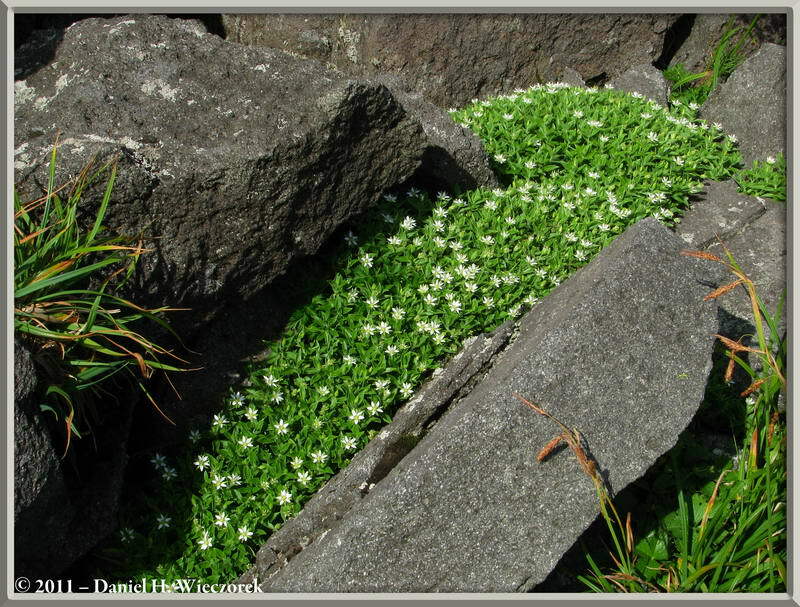 The 3rd shot is Arenaria merckioides var. 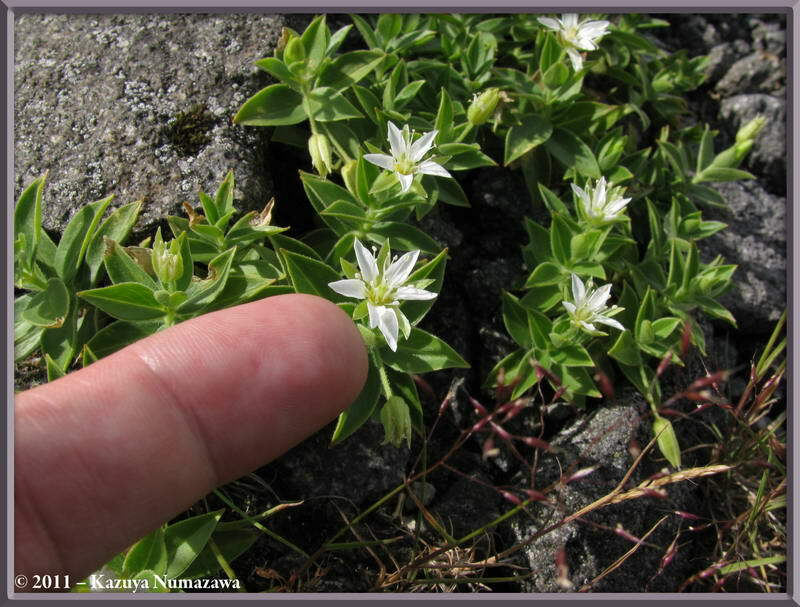 chokaiensis - the rare flower - with Kazuya's forefinger as scale. Here is another scenery shot - beautiful clouds. 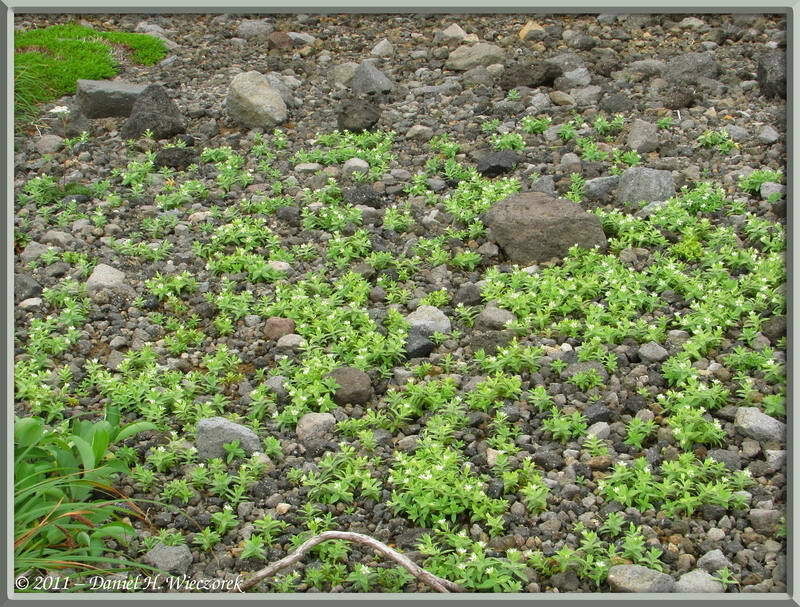 The 2nd shot is a patch of Arenaria merckioides var. chokaiensis - the rare flower. 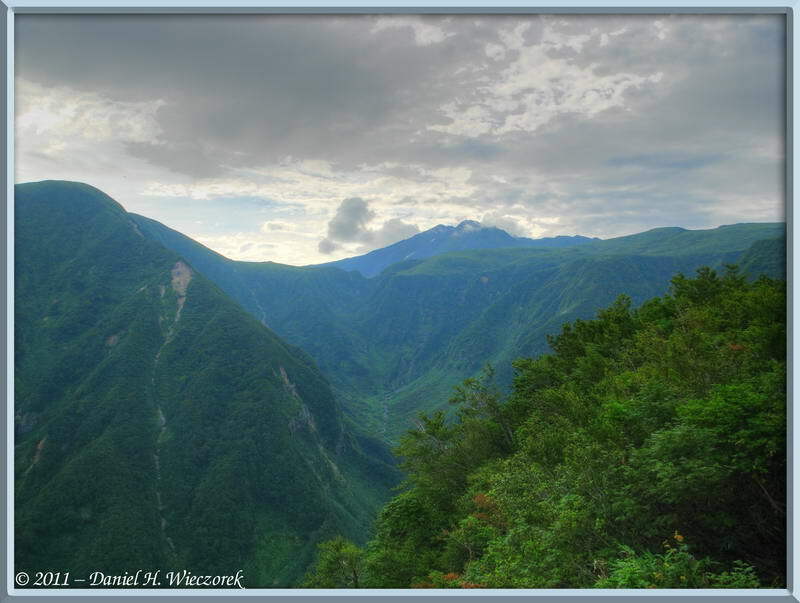 The 3rd shot is a cloud/scenery shot. Notice how that cloud has built since the first photo in this row. Okay, now we are rested and we are heading for the summit for the sunset time of the day. 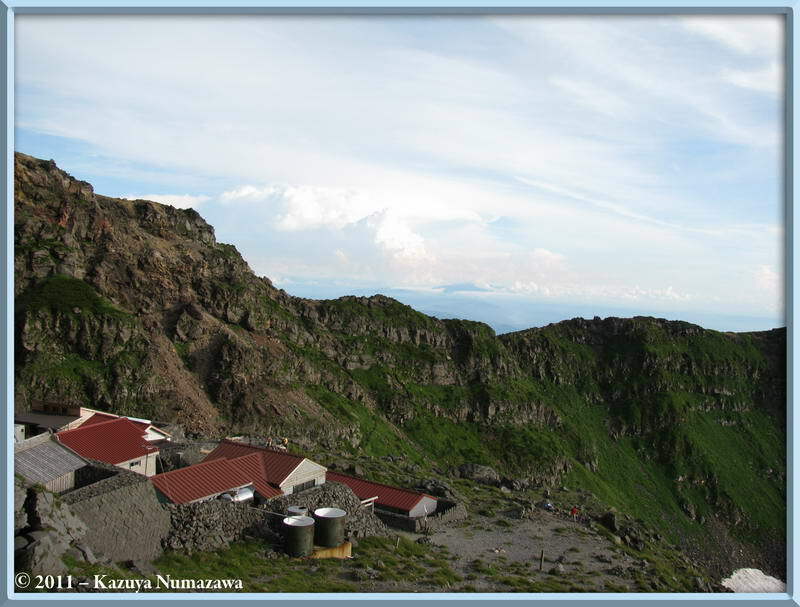 There is the hut complex below us. 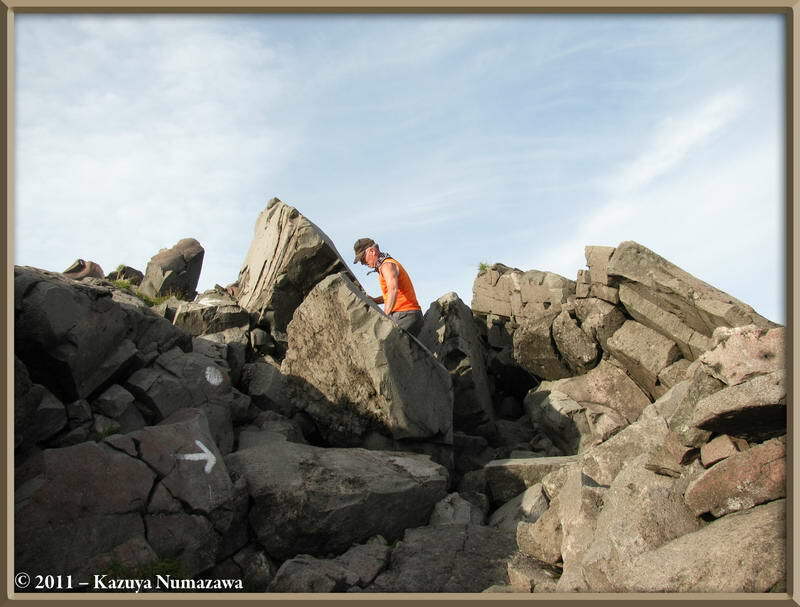 The 2nd shot is me following the white arrows which will guide us to the correct summit. On our first climb of this mountain, back in 2005, we did not pay close attention to the arrows and we ended up on a false summit at sunset. 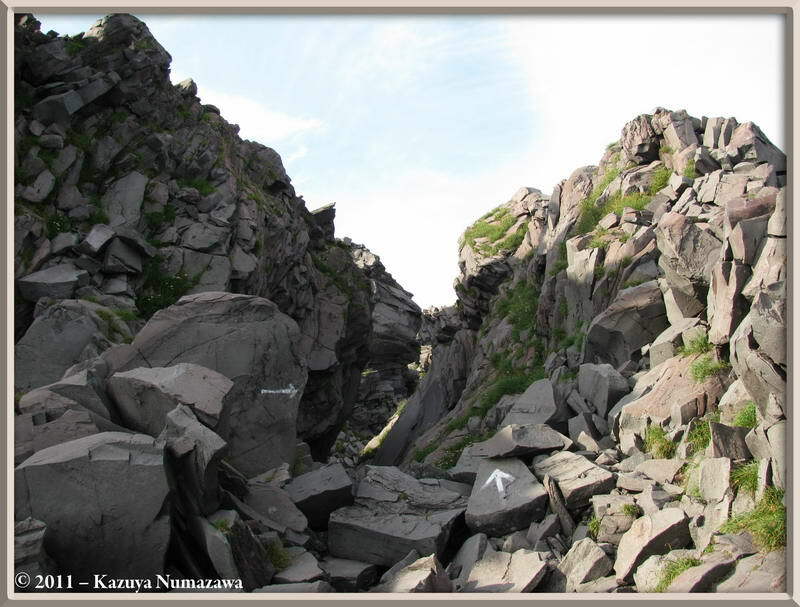 The 3rd shot shows more of those white arrows which must be followed to arrive at the (true) summit. 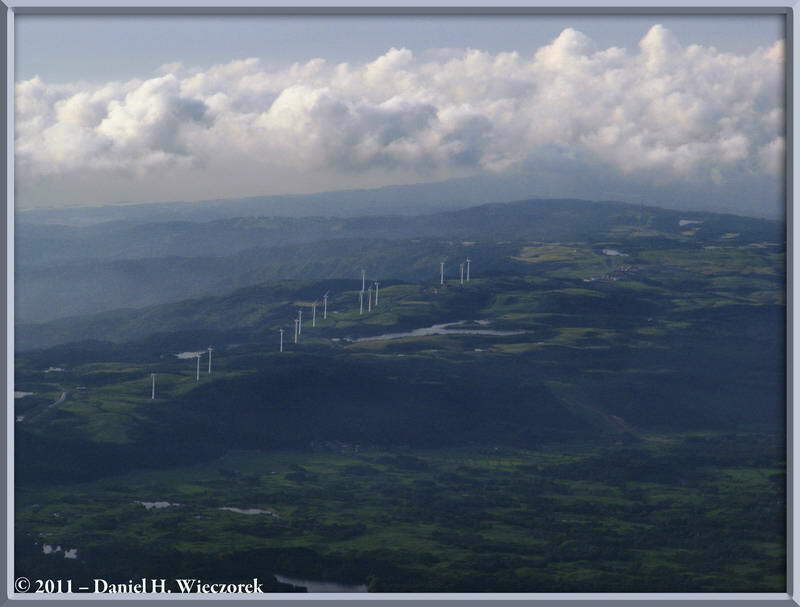 The first shot shows a line of wind-power generators lying along a low ridgeline. The 2nd and 3rd shots show Mt. Gassan off to the south - remember, that is where we were 2 nights ago. 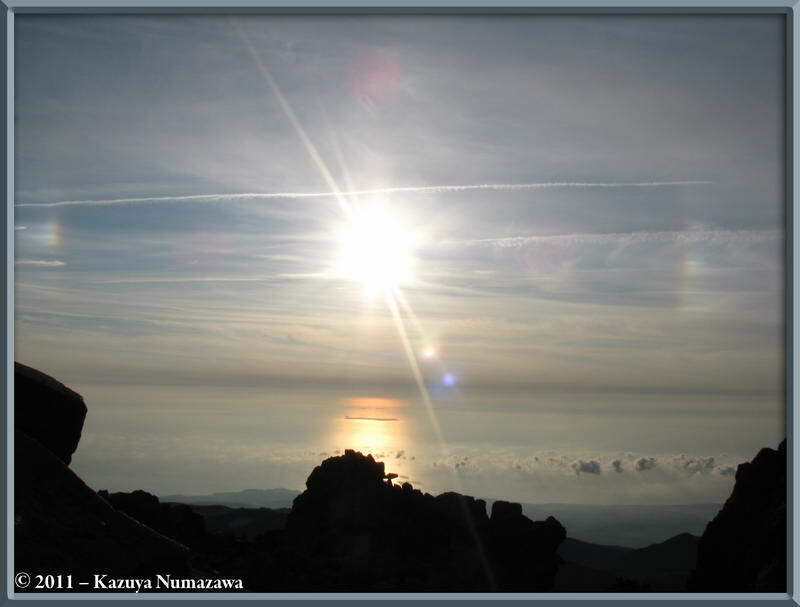 The first shot in this row was taken at 5:48 PM - You can see the setting sun, Tobishima (Tobi Island) and twin sun-dogs on either side of the sun. Sun dogs appear at 22° distant and at the same distance above the horizon as the sun. 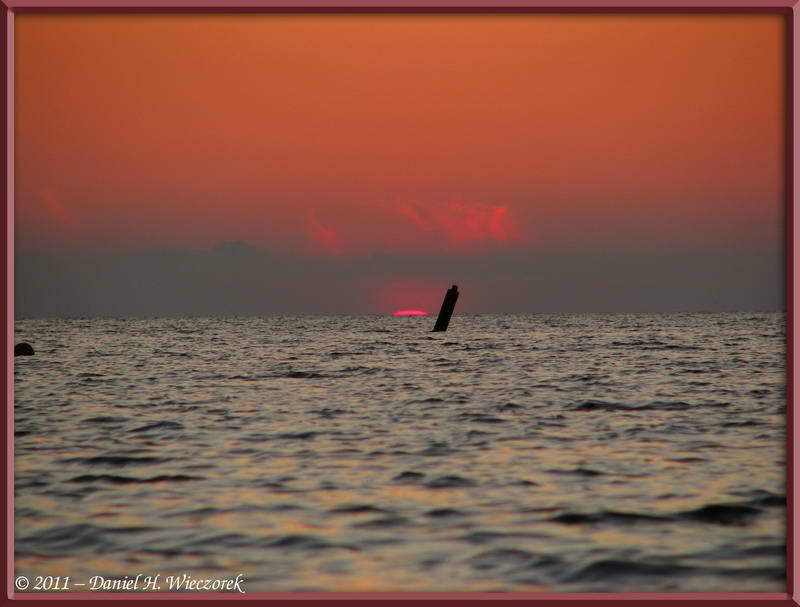 Sometimes they only last for a moment, sometimes they can be seen for quite a long time. On this day we had the treat of being able to see them for at least 30 minutes - an amazingly long time. 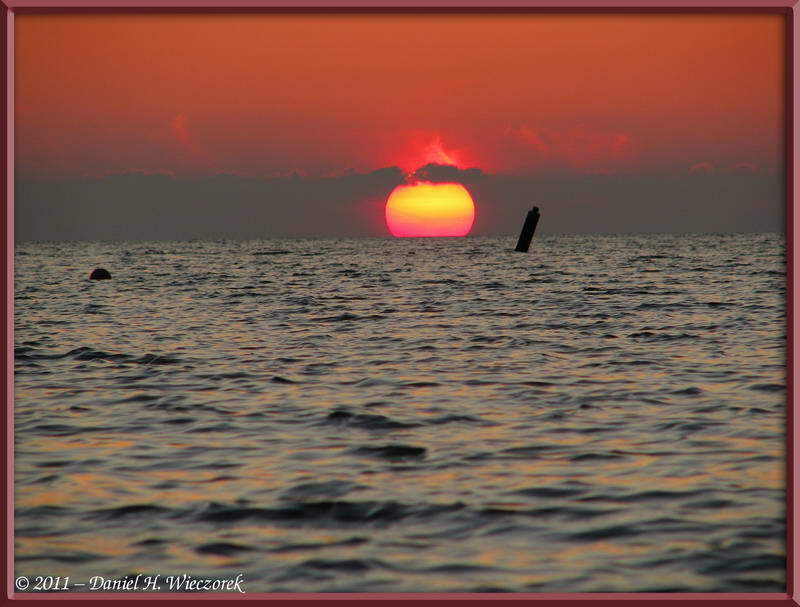 You'll be seeing more photos of this sun dog phenomena. 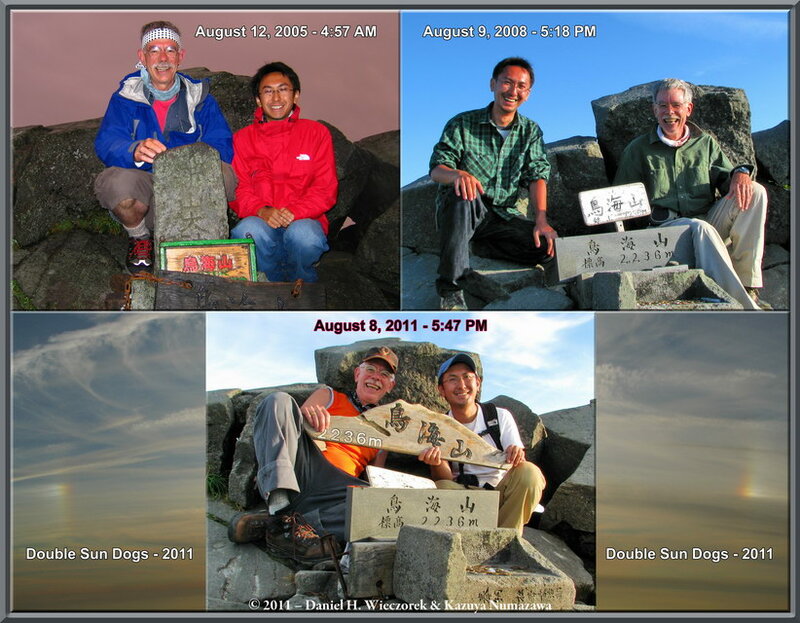 The 2nd shot shows us at the summit of this mountain on all 3 climbs. 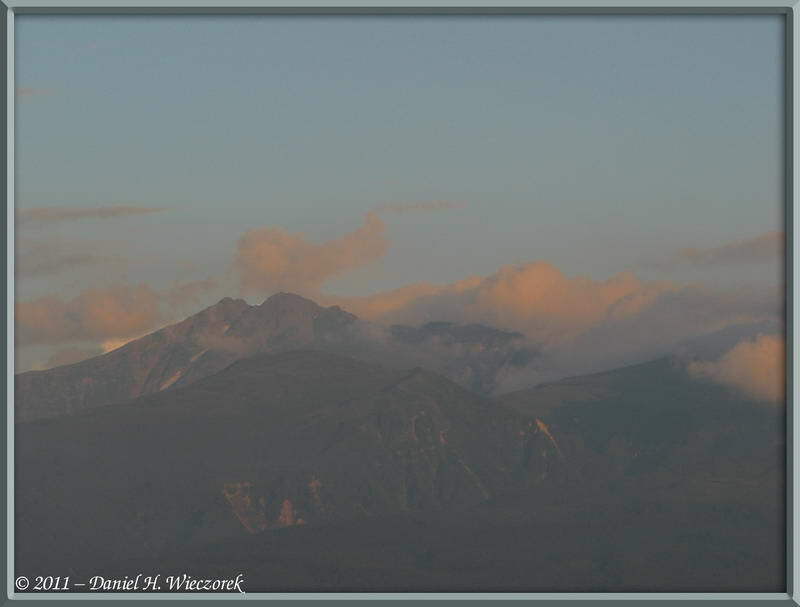 You might note that this is the warmest weather we have experienced on this peak - in 2005 - at sunrise, we were COLD! In 2008 at sunset - we were cold! This year, 2011 we were not cold at all! The 3rd shot is the twin sun dogs at 5:53 PM.